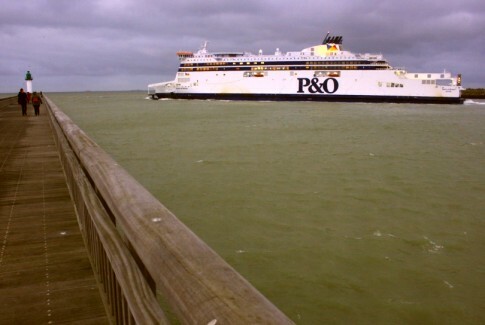 P&O’s Spirit of Britain, now in service on the Dover-Calais route, is the first purpose-built passenger ship for this operator on this service since 1987 and the new ship’s vast scale makes her perhaps the most significant new Dover ship since that 1987 pair, the Pride of Calais and Pride of Dover. 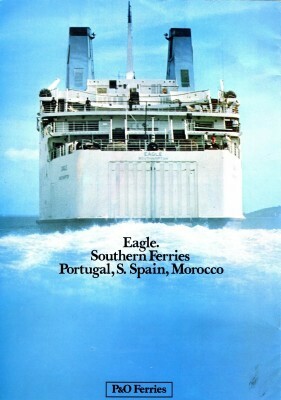 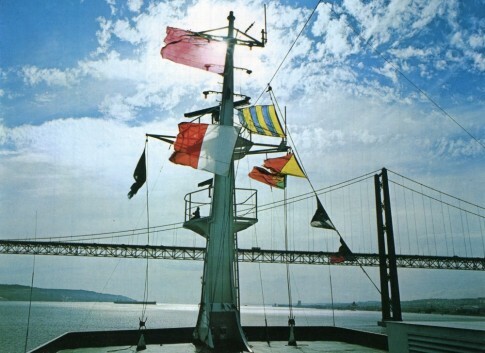 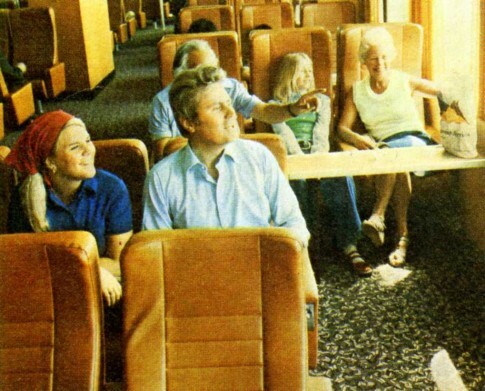 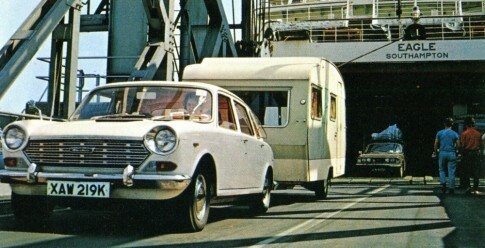 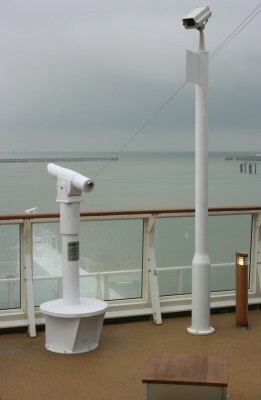 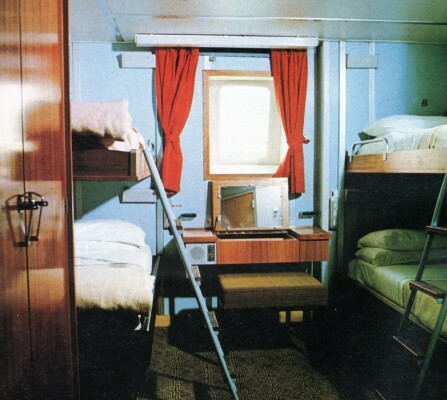 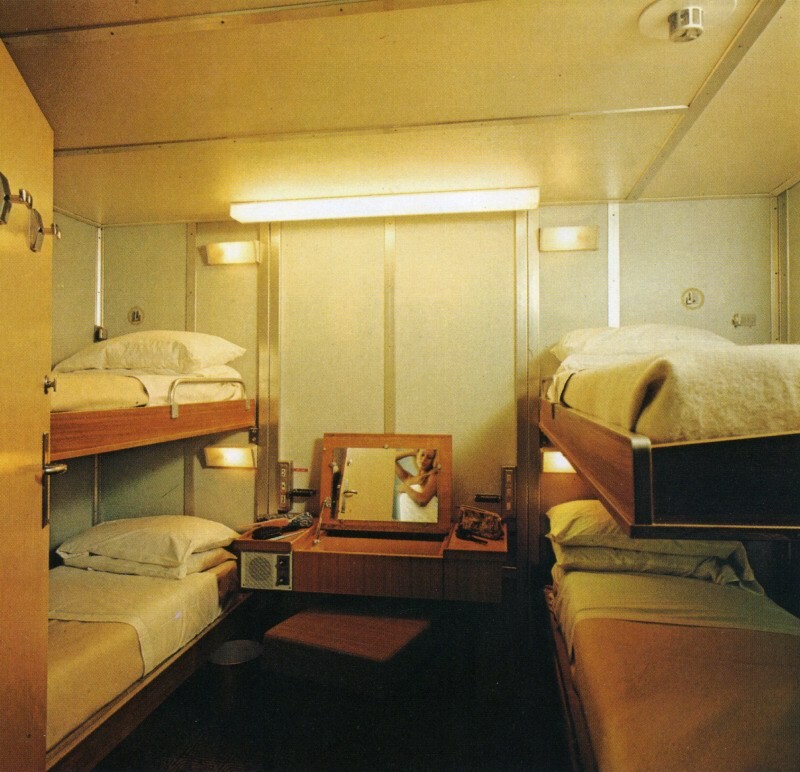 On a technical level the ship dispenses with various Townsend/P&O short sea traditions – from the clam shell vehicle deck doors used on all local ships since 1979 to the triple-screw arrangement which had been a feature on passenger newbuilds from the Free Enterprise IV in 1969 to the 1987 Prides. 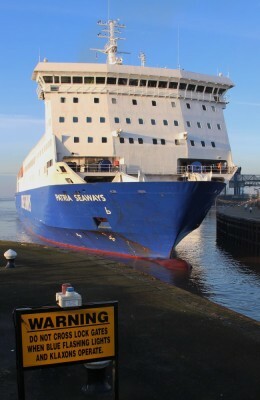 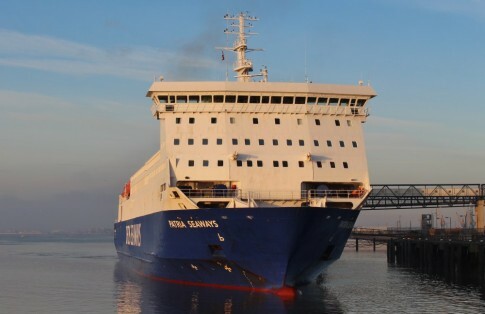 The new ship instead has a more conventional twin-screw layout with a bulbous bow forward rather than the bow rudders of the 1980s-era ships; one consequence of this is that the Sprit of Britain will most often turn inside the harbour on departure from Calais whereas the Pride of Dover/Calais usually reversed right out of port and turned outside the harbour entrance. Initial reviews of the vessel’s passenger spaces have been slightly mixed; P&O have always been rather traditional at heart and it seems to show in this ship. 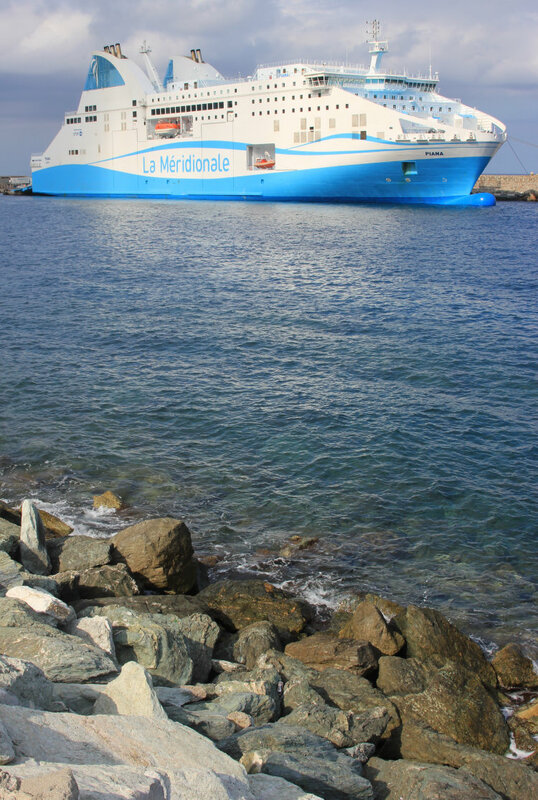 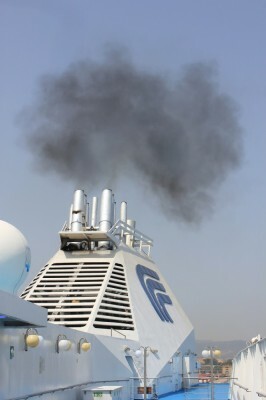 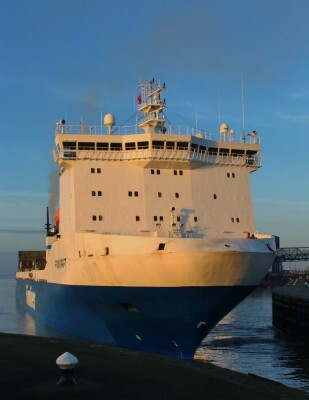 Whereas rival predecessors such as the Seafrance Rodin and the Maersk Dunkerque made expressive use of light and space in an effort to make a positive and attention-grabbing impact on the ferry zeitgeist, there is little, if anything, here which is revolutionary or untried in other ships from a variety of other operators. 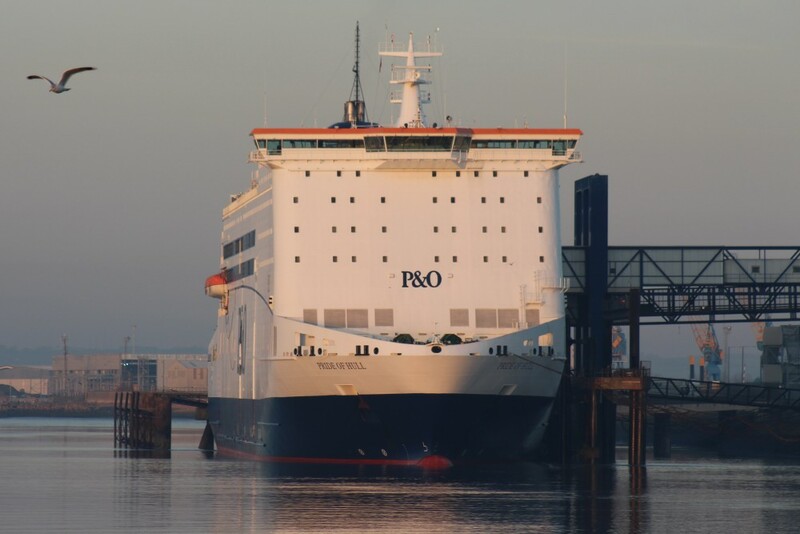 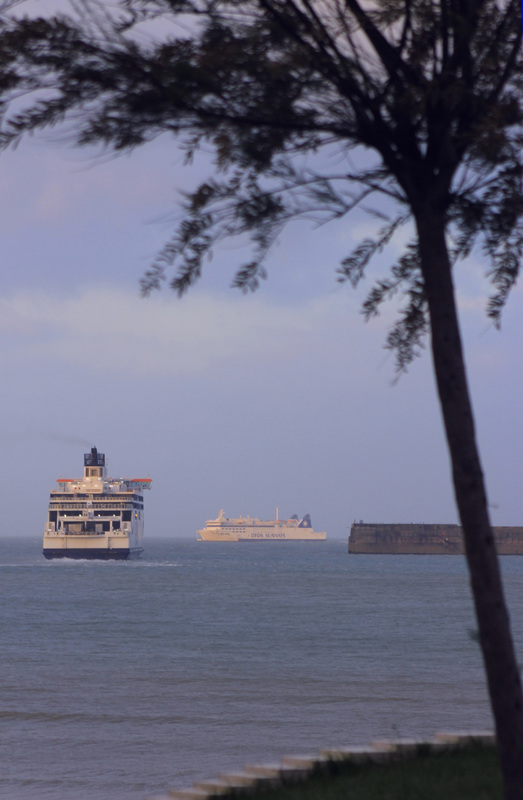 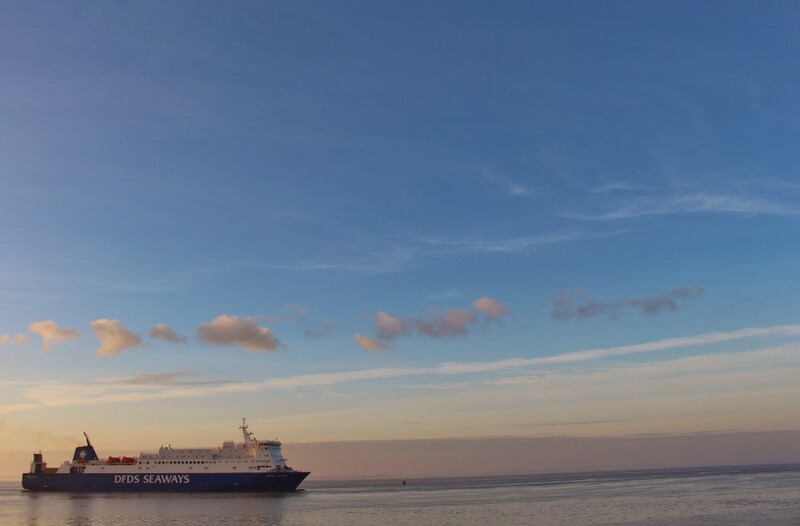 There is no doubting though that the Spirit of Britain has been built to an exceptional standard, and the ship is certainly head and shoulders above any of the other P&O ferries at Dover. 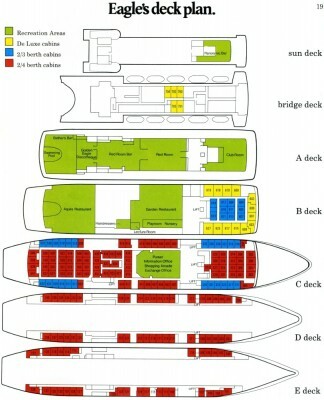 Spirit of Britain passenger decks general arrangement. 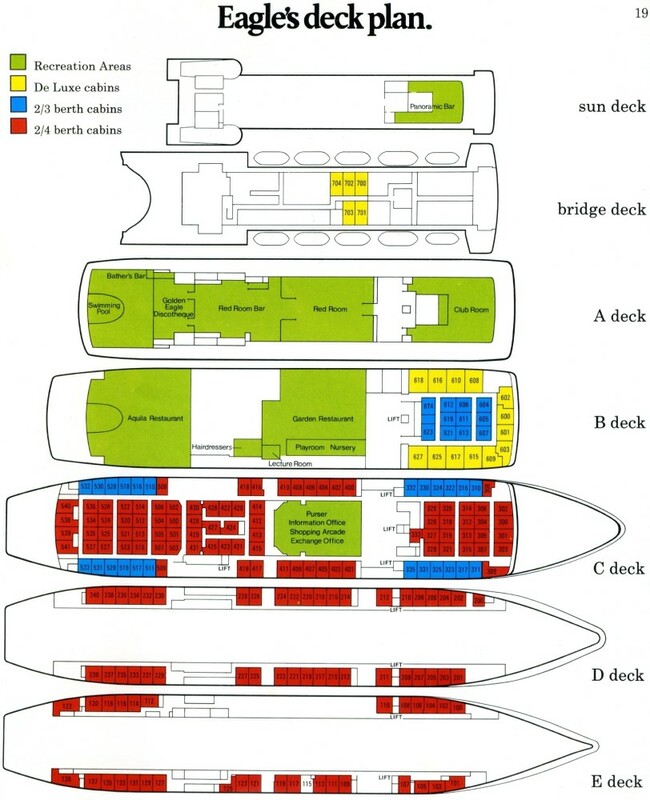 The layout of the Spirit of Britain’s passenger decks is interesting; the lower of the two, Deck 8, is almost perfectly symmetrical. 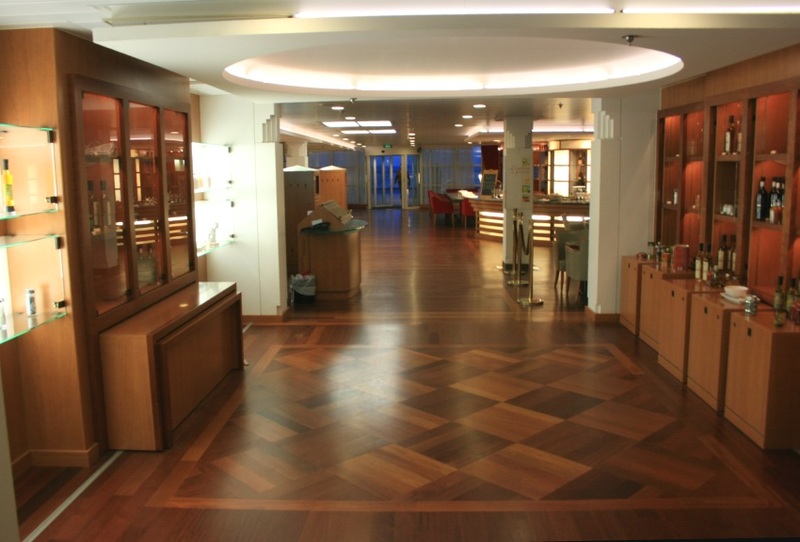 Right aft is an area of open deck with, just forward, ‘The Bar’, ahead of which are a pair of broad side arcades fronting onto the centrally located shop; the reception desk and bureau de change are situated on the starboard side. Right forward is the ‘Family Lounge’ where the internal focus of the circular central section can be seen as a scaled-up version of the forward saloons on Seafrance Rodin and Berlioz. 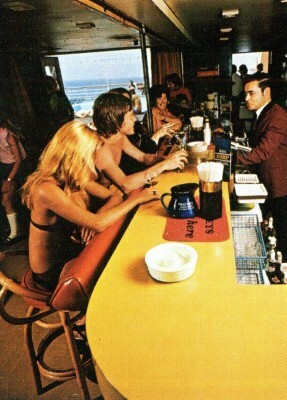 Spirit of Britain: 'The Bar'. 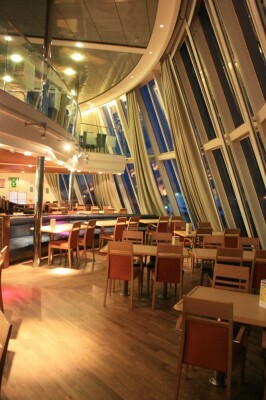 A corner of The Bar, overlooked by Tower Bridge. Spirit of Britain: The Bar. 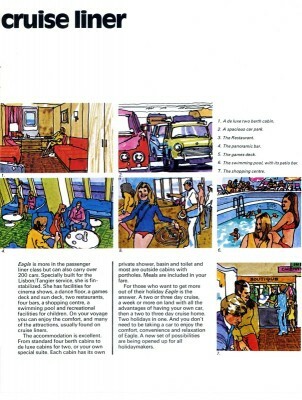 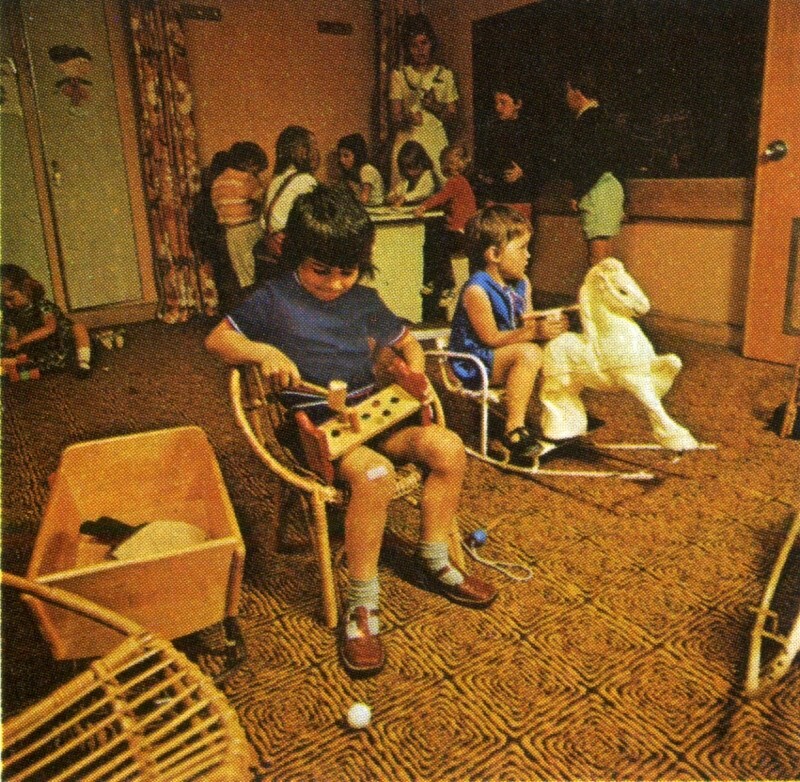 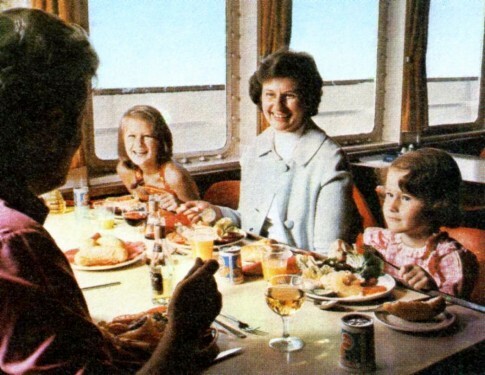 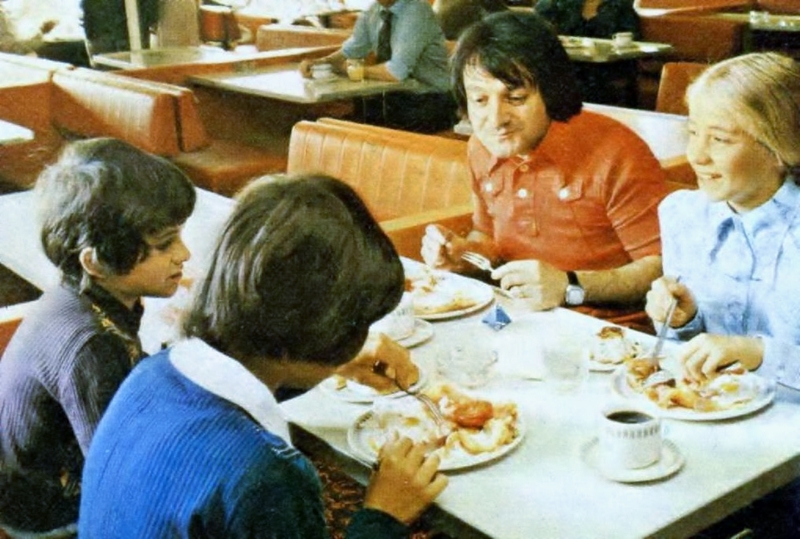 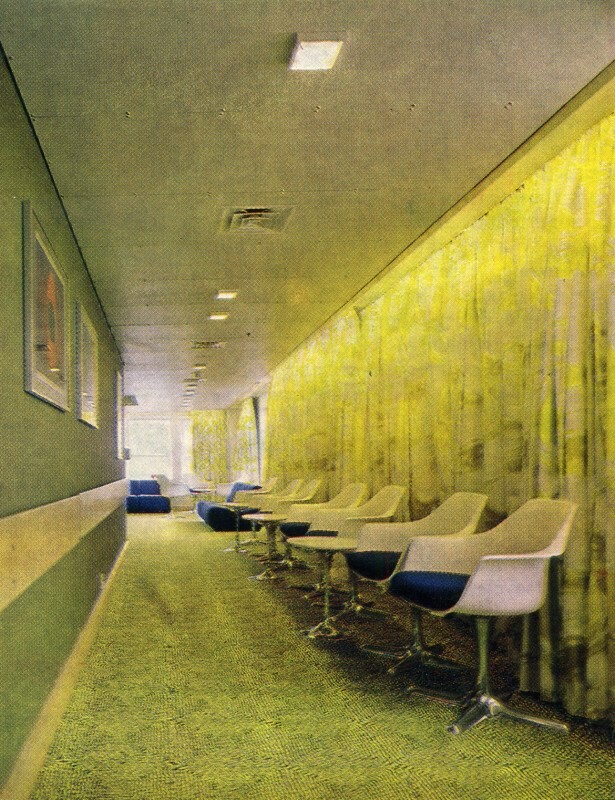 Spirit of Britain: The Family Lounge. The centre section of the Family Lounge, whose inward focus is reminiscent of the forward saloons of the Seafrance Rodin and Seafrance Berlioz. 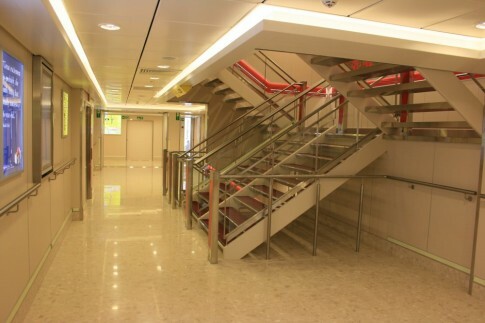 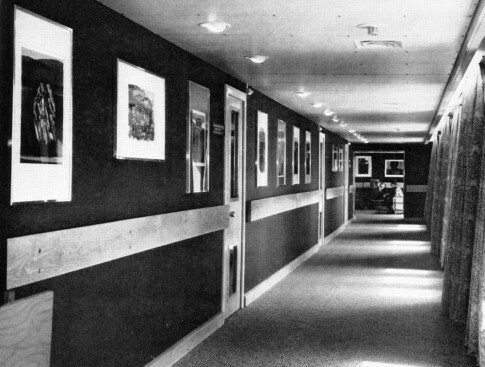 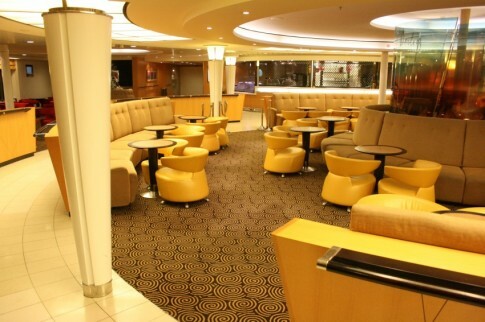 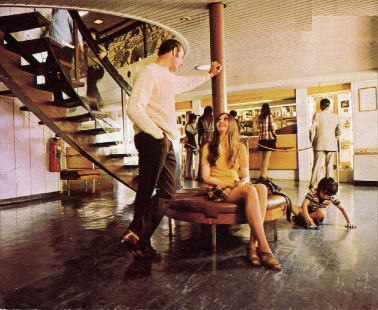 In contrast, up on Deck 9, where the Brasserie, self-service (the ‘Food Court’), Club Lounge and ro-ro drivers’ area can be found, the layout is anything but symmetrical or, indeed, easily navigable: each of these spaces is effectively reached by a dedicated staircase from the deck below (the ro-ro area is walk-through and can be reached from either the red (self service, forward) or yellow (Brasserie, just aft of amidships) staircases). 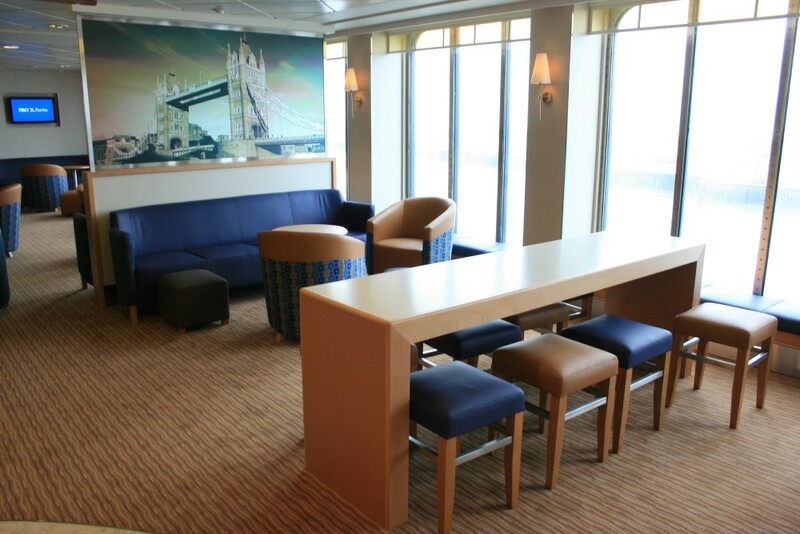 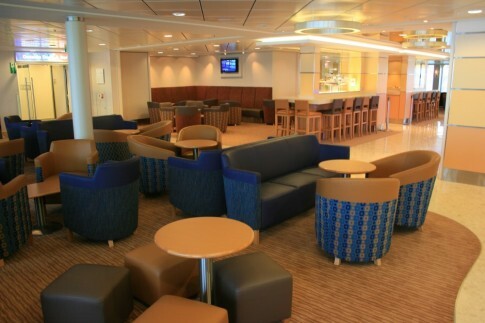 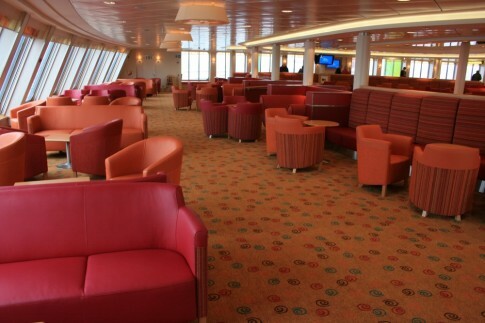 The Club lounge and outside decks are accessed via the aft blue stairway. 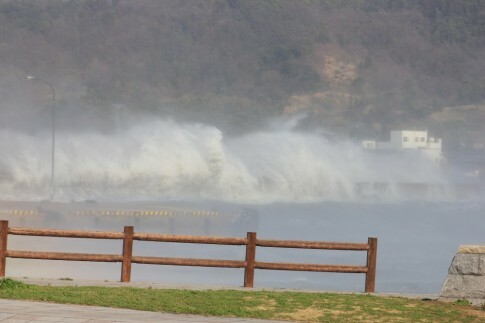 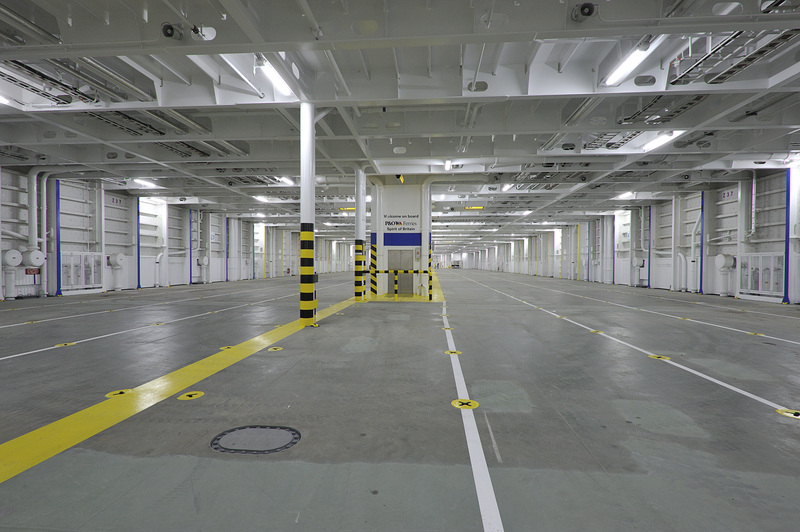 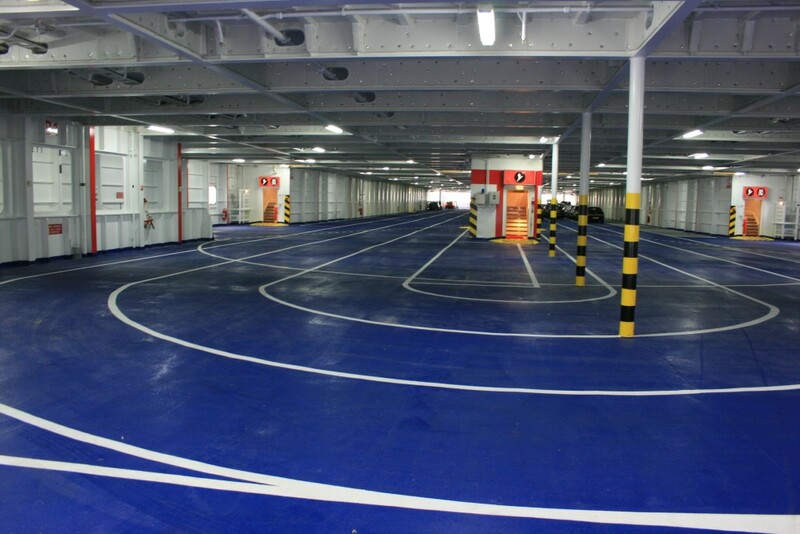 Unless one walks through the ro-ro drivers’ area there is no possibility of fore/aft passage on this deck. 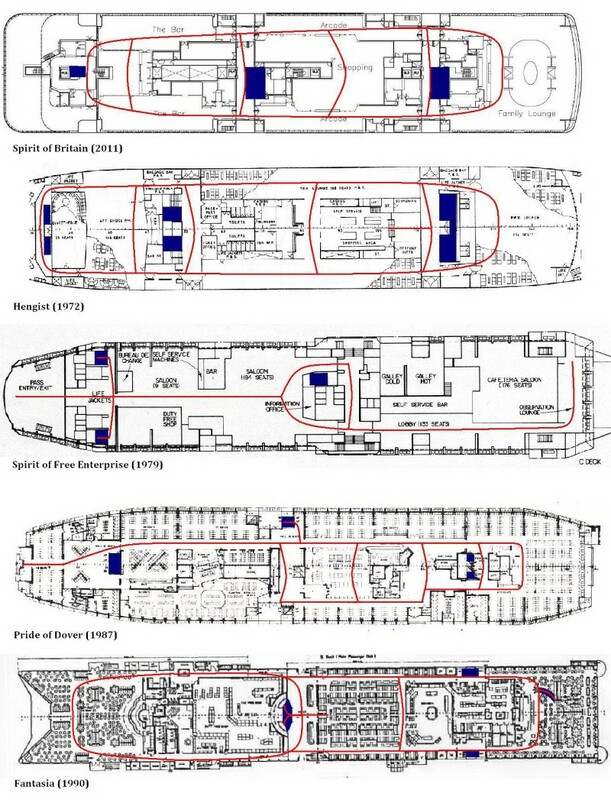 Although the arrangement on Deck 8 in particular draws considerably from the ‘Darwin’ sisters (the current Prides of Canterbury/Kent), from an historical perspective a near-symmetrical plan for the lower deck incorporating this kind of perimeter circulation pattern, combined with a distinctly asymmetrical plan upstairs is actually intriguingly outside P&O/Townsend Dover practice going as far back as the Free Enterprise IV. 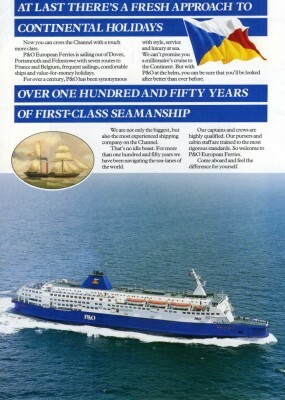 It is, in fact, more in line with the traditions of the railway fleets, being similar in concept to the plans adopted by such ships as the Vortigern, Cote d’Azur or Fantasia; indeed the plan for Deck 8 is actually quite a close rendering of the basic concept of that of the Hengist and her sisters with bars forward and aft, side circulation via de-facto side lounges amidships inboard of which can be found a shopping centre. 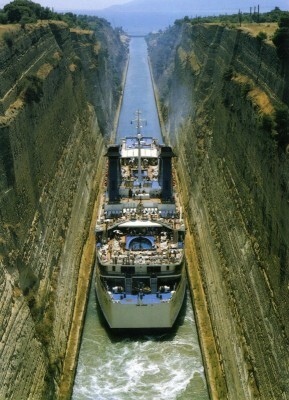 The execution, styling and scale, it should be pointed out, bears little in common with the railway vessels. 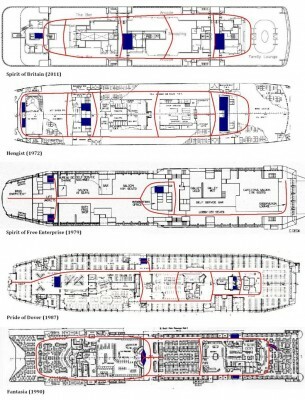 Spirit of Britain main deck passenger orientation routes compared to some other notable Dover Strait car ferries. 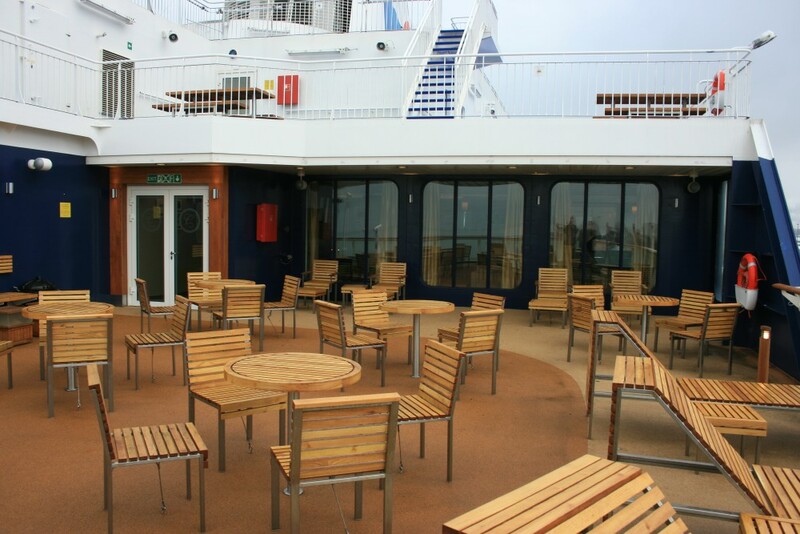 The Deck 9 arrangement is perhaps best understood in terms of what I have an awful feeling P&O designers might call “destination venues” – places to eat or be pampered rather than ‘merely’ to sit or drink. 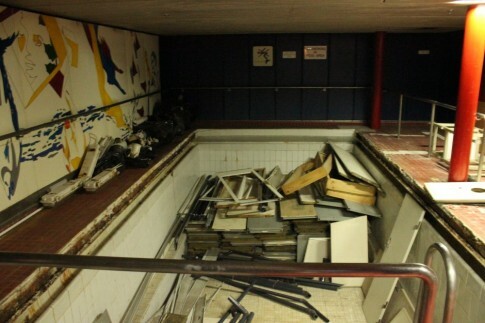 Clearly, a decision was made at an early stage to repeat the formula of the two previous key reference generations – the Prides of Dover/Calais and the ‘Darwins’ – to locate these saloons upstairs. The solution does give the key benefit of allowing a single galley to service the Food Court, Brasserie, ro-ro restaurant, Club lounge (which also offers light snacks) and crew mess areas with no upstairs/downstairs movement of food. 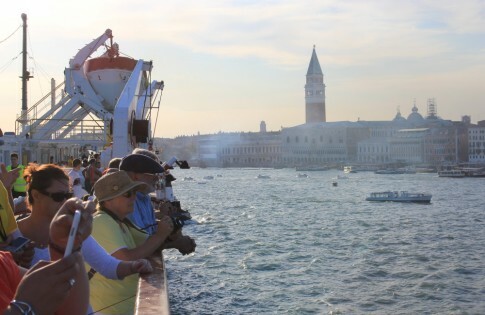 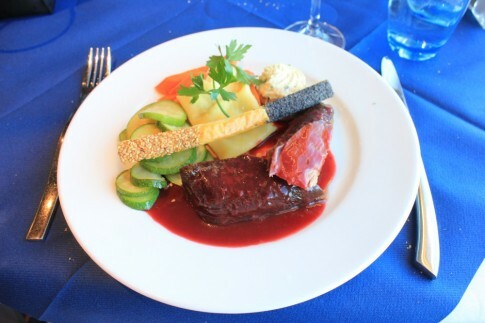 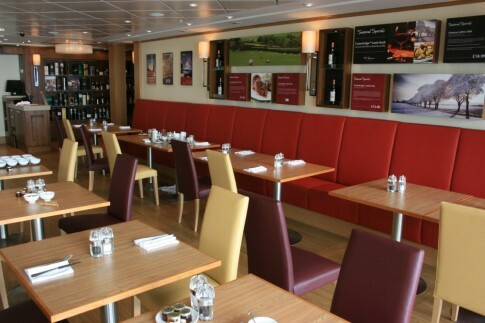 On the other hand it does leave the public restaurants in particular rather out of the way; P&O doubtless believe that anyone who wants to eat aboard will hunt out their preferred facility anyway, minimising any revenue loss. Passenger orientation: the money motive? With the latter point in mind, it is also worth noting that the majority of saloon-to-saloon movements a passenger is likely to make whilst aboard require them to walk past the large, brightly lit and inviting shopping centre. The inability to transit between the forward and aft parts of Deck 9, say from the self service to the Club lounge or outside decks, means that one has first to return down to Deck 8, walk past (and hopefully into) the shop, before heading up one of the aft staircases. 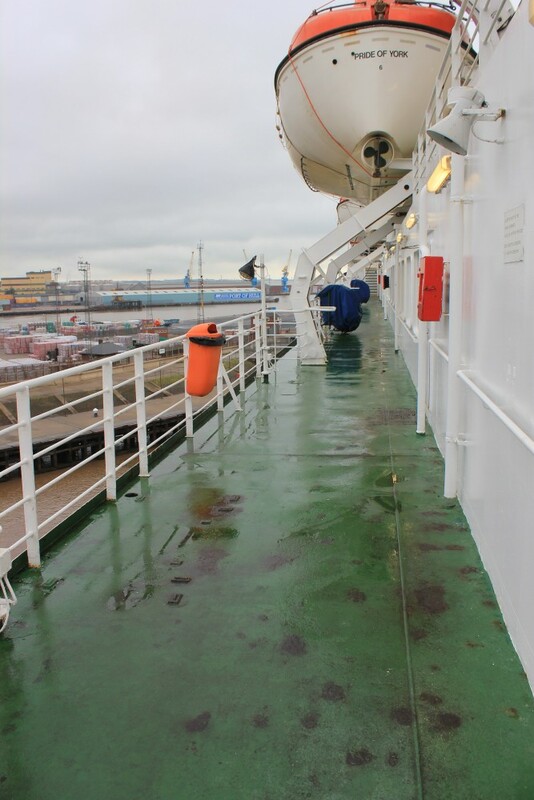 This reliance on Deck 8 as the orientation deck further underscores the importance of its easily-understood general arrangement. 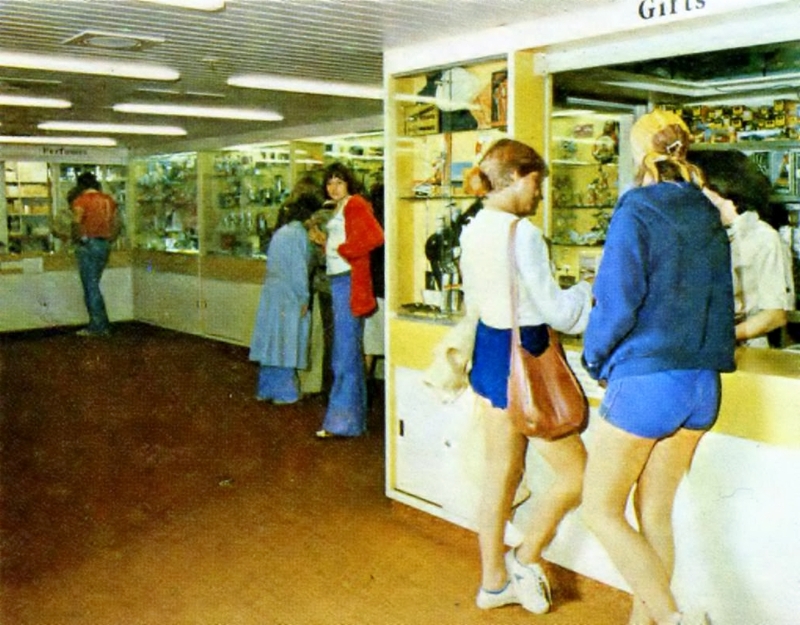 Spirit of Britain: port-side arcade with the shop inboard. 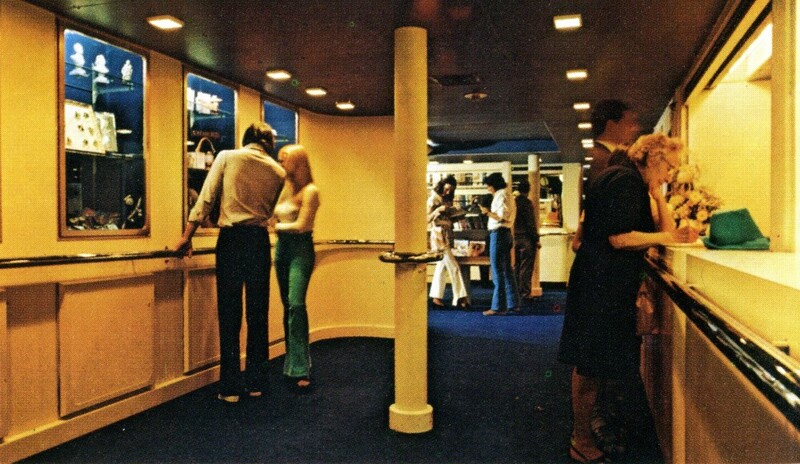 Pride of Kent: starboard-side arcade. P&O have also adopted a simple colour-coding system aboard with, for example, the red colour of the forward staircase being echoed in the colour schemes of the self service, family lounge and entranceway to the ro-ro lounge. 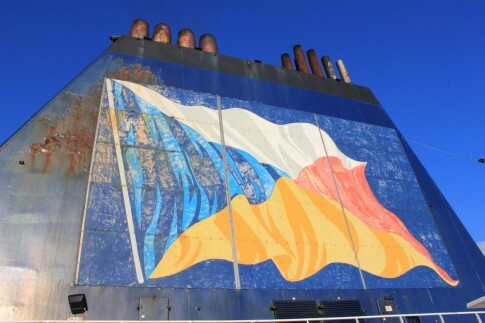 The two other primary colours of the P&O houseflag, blue and yellow, form the schemes for the after two stairwells. 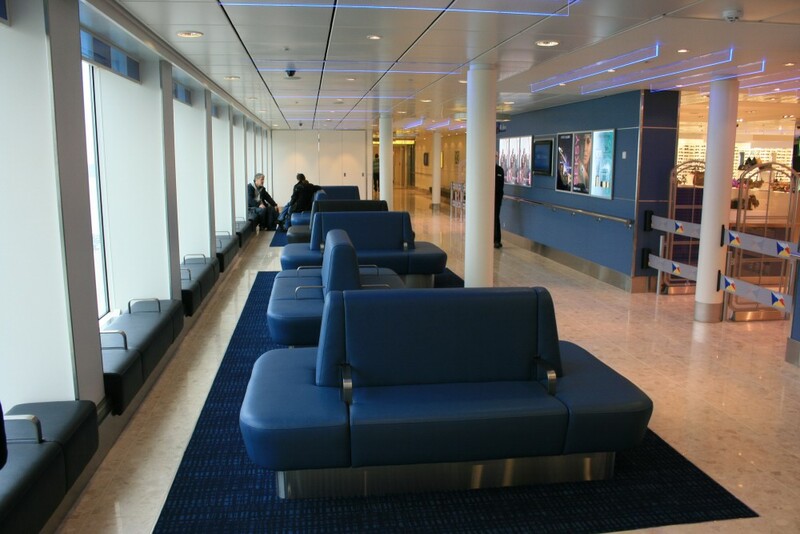 Generally, however, the staircases and especially the lobby spaces are disappointing, the latter repeating the featureless seen on the ‘Darwins’ where other STX newbuilds have made more of an effort. 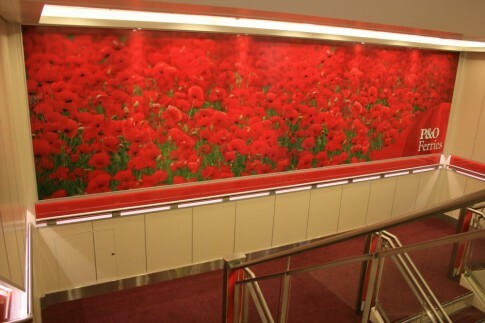 Spirit of Britain: Red staircase. 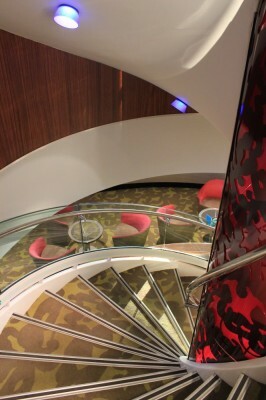 Spirit of Britain: forward staircase at Deck 8 level. 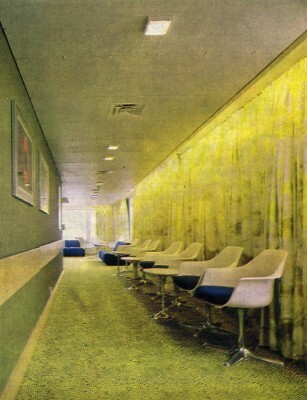 Pride of Kent: aft lobby. 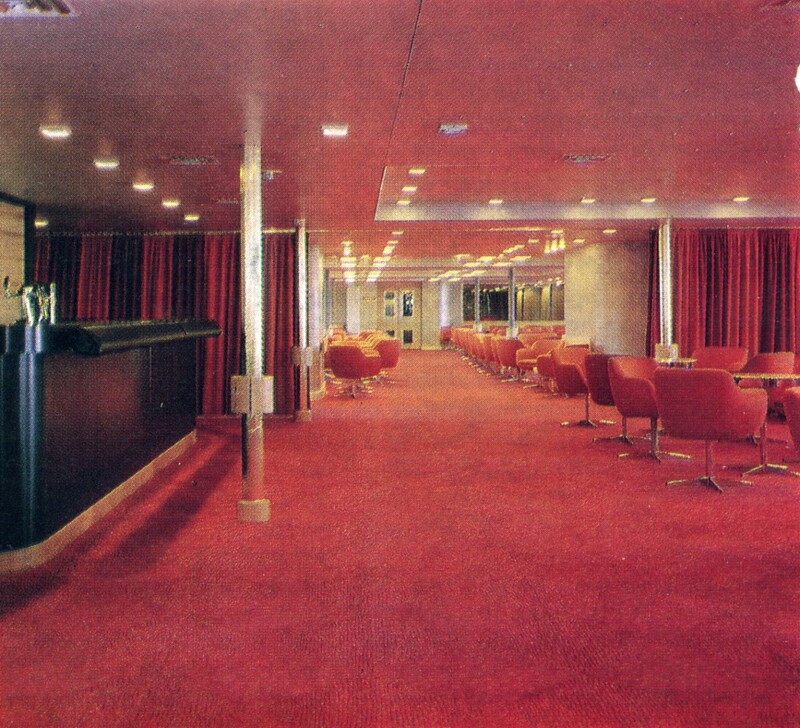 Spirit of Britain: Club lounge entrance. 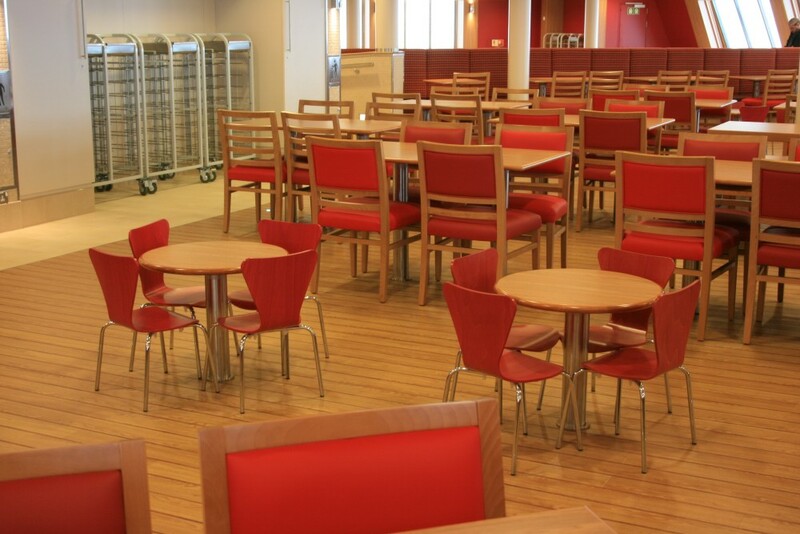 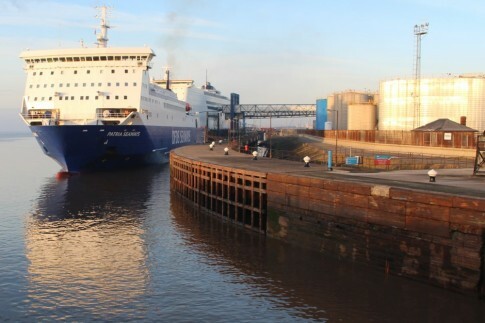 Previous ships to have given such a prime location to the self service restaurant include the Spirit of Free Enterprise and her sisters, the Pride of Burgundy of 1993 and, perhaps most relevantly, Norfolkline’s recent Maersk ‘D’ class. 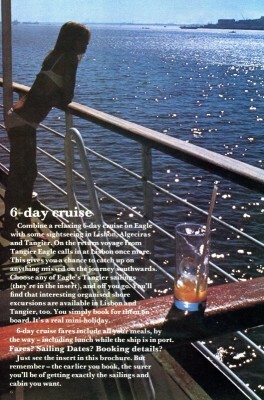 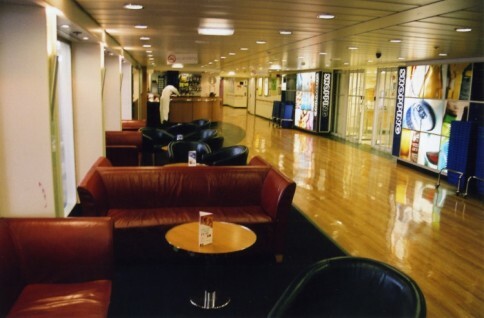 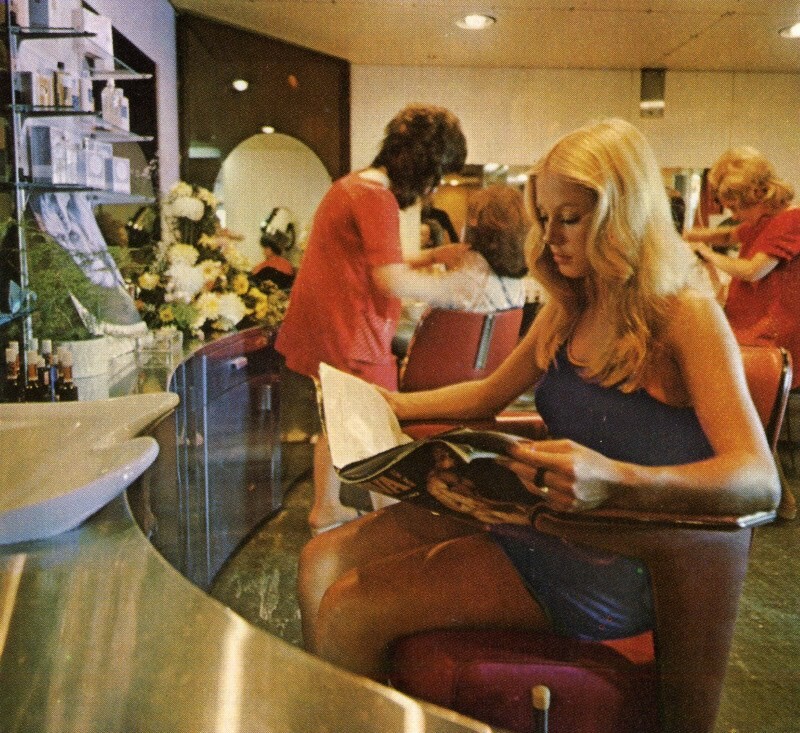 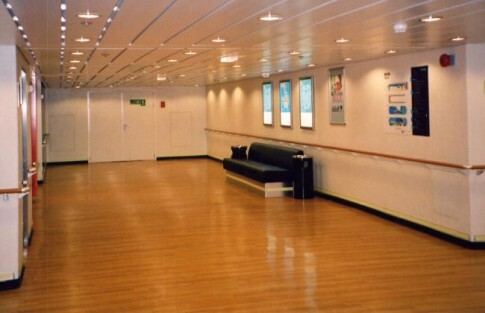 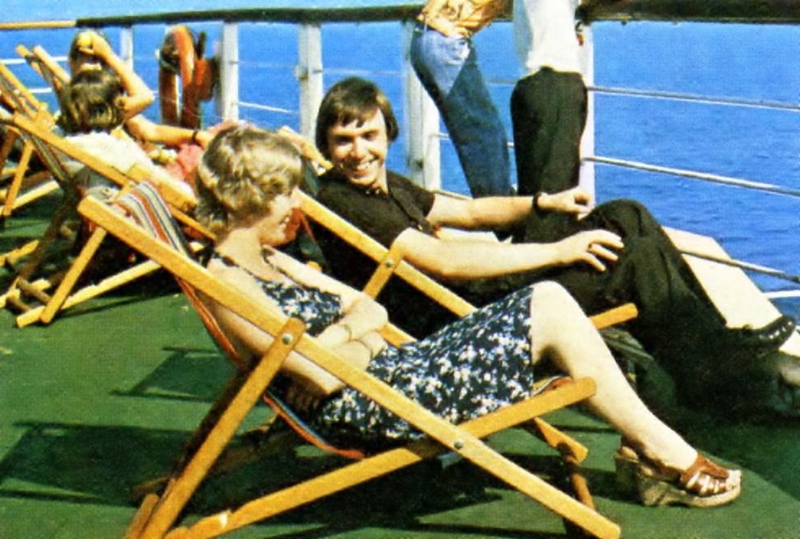 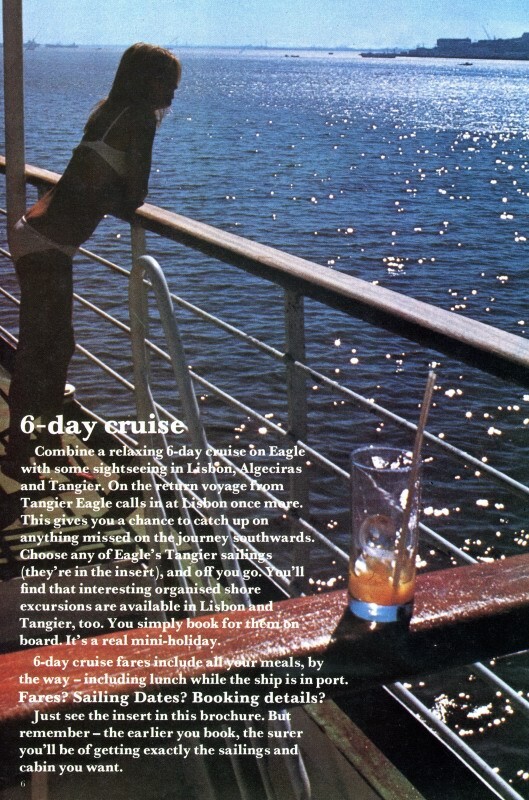 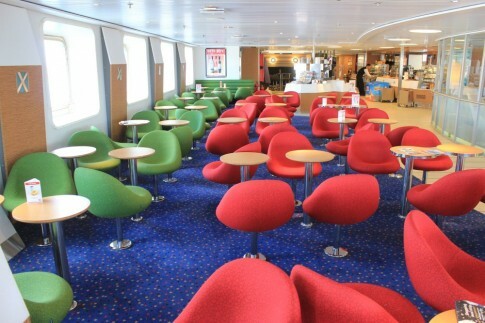 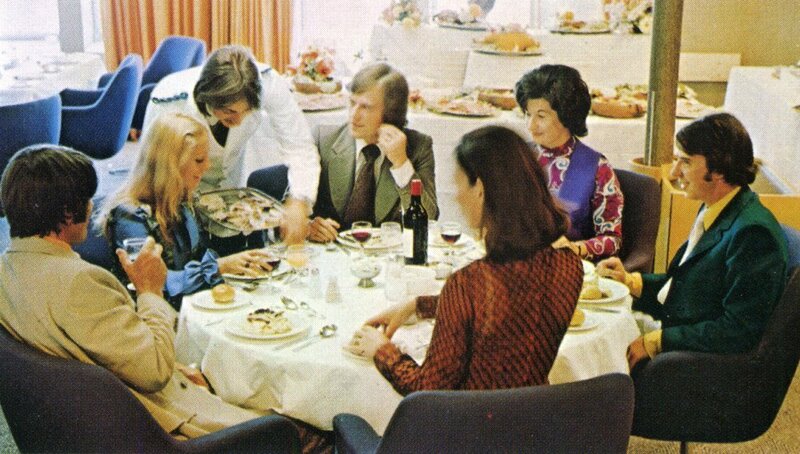 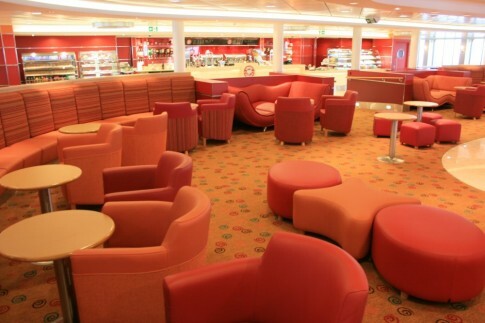 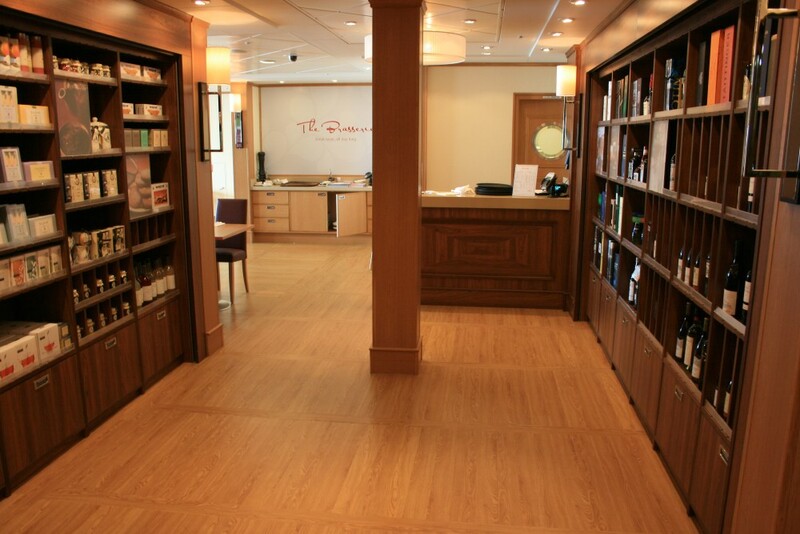 P&O/Townsend had a consistent self service aesthetic involving fixed moulded fibreglass seating on ships from the Spirit of Free Enterprise until as recently as the ‘Darwins’. 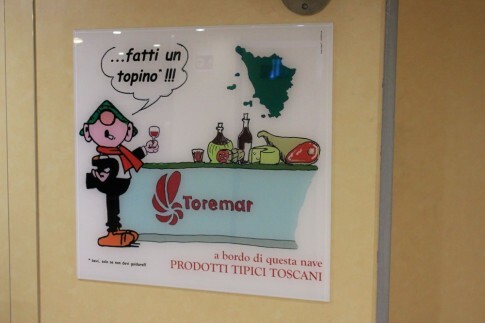 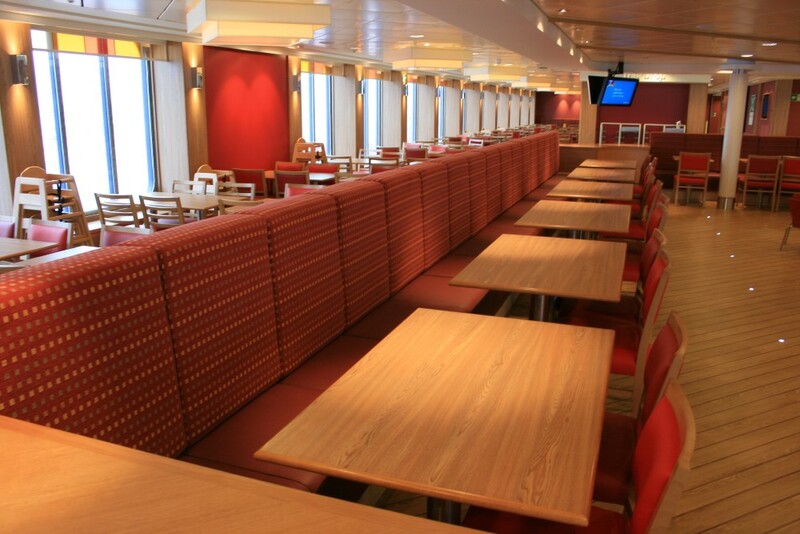 This is comprehensively rejected in the new ship’s Food Court in favour of a more modern approach, which is actually rather understated and also owes something to other recent Aker/STX deliveries such as Tallink’s Star or Viking XPRS. The adjacent Commercial Drivers’ area, complete with showers, sleeper seats, separate hot food servery, and outside deck is excellent and, again, takes some cues from the ‘D’ class. Spirit of Britain: The Food Court. Maersk Dover: Panorama Self Service. Pride of Canterbury: in contrast, the old-school International Food Court. 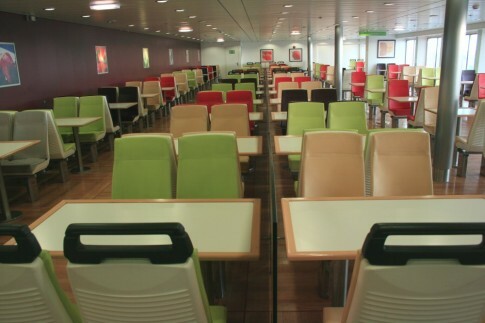 The Spirit of Britain's Food Court offers seating for all sizes of passenger. 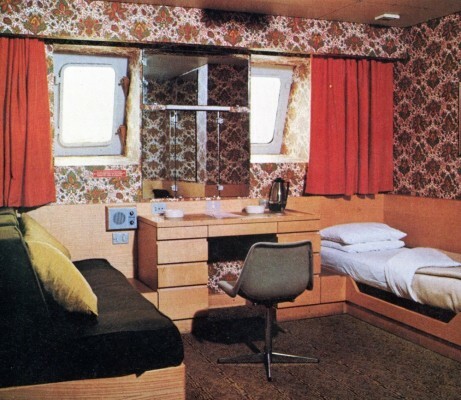 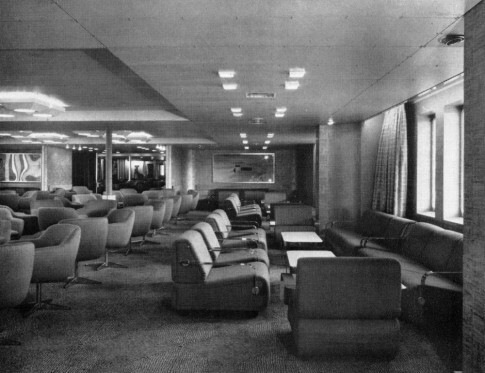 Spirit of Britain: Commercial Drivers' lounge. 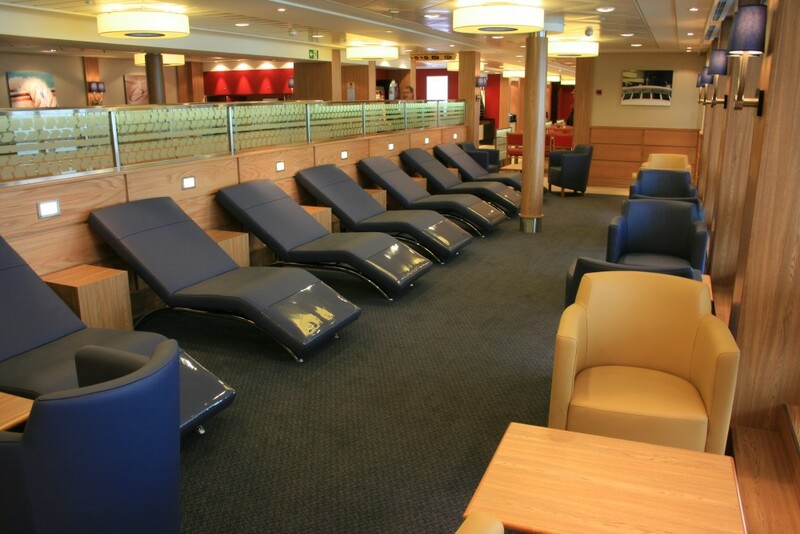 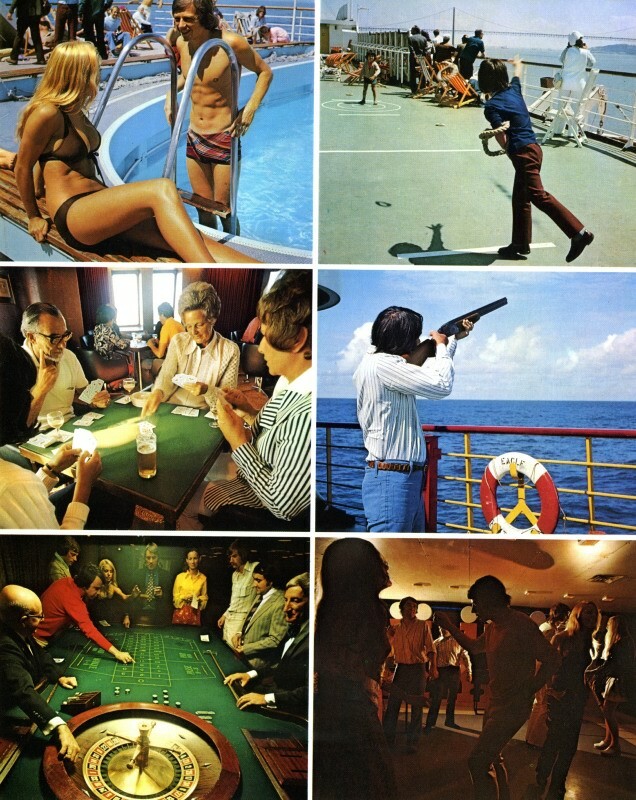 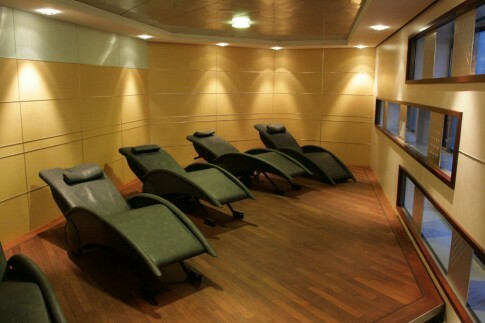 Maersk Dover: Road Kings relaxation lounge. 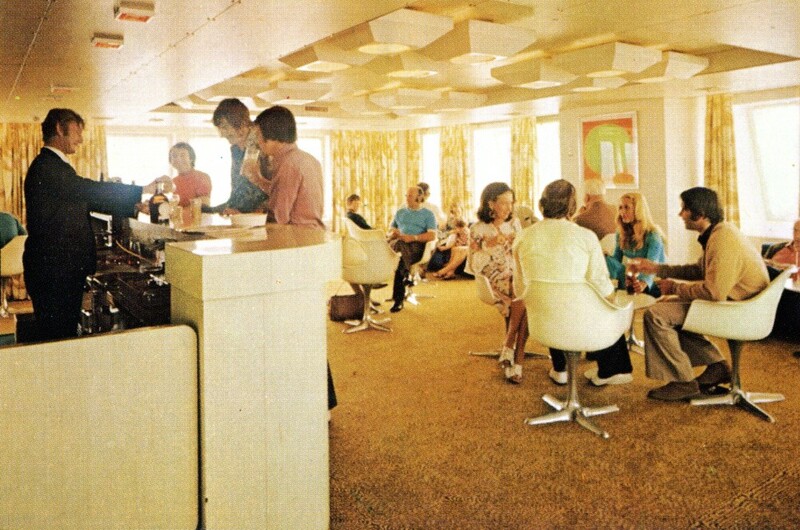 The coolly luxurious Club Lounge on the Darwin sisters was perhaps their biggest success and the decor of the equivalent space on the new ships draws on this, to a degree at least. What is more surprising, however, is both the size and the location: unlike the ‘Darwins’ and the Prides of Dover and Calais, which gave over the entire forward part of the upper deck to the Club Lounge, on the Spirit of Britain this and the Brasserie restaurant are squeezed in aft on the starboard side, effectively swapping places with the self service when compared to the previous generations. This switch does give the benefit of being able to offer a dedicated outside deck for Club, but the vibration in this part of the ship does not particularly lend itself to such a premium space. 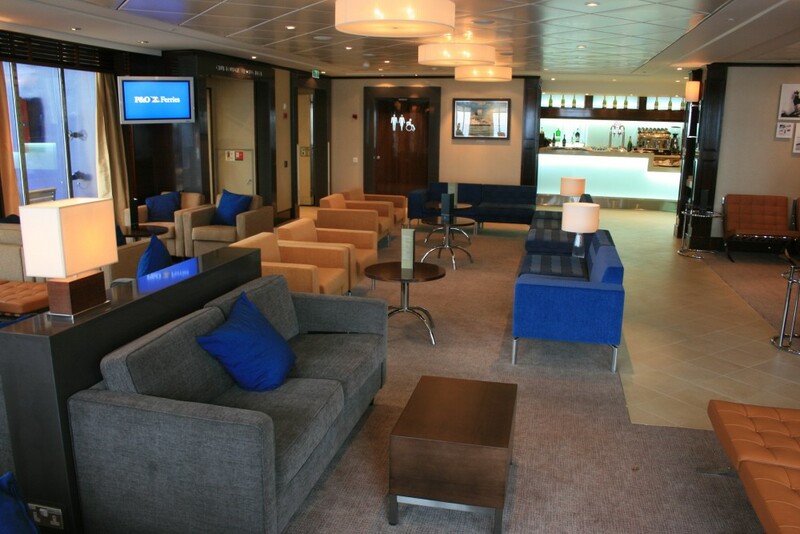 Perhaps most unexpected though is the Club Lounge’s size: the saloon, excluding the outside deck, offers less than half the area of its predecessors. 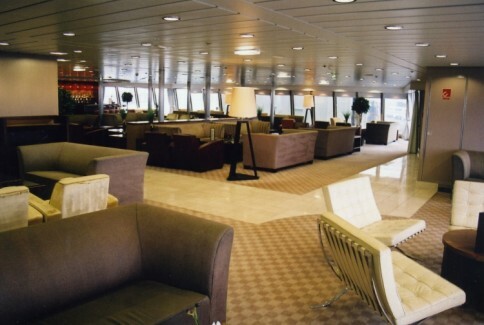 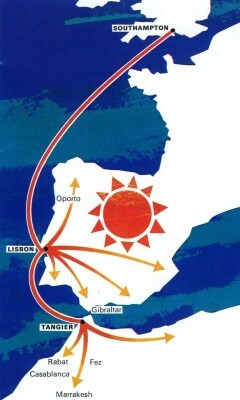 A calculation was apparently made by reference to the numbers of people who actually used the lounge but this appears to entirely miss the point that not only do Club passengers pay a premium for the champagne and nibbles but also for the feeling of space that may be denied to them elsewhere on board during a busy crossing. 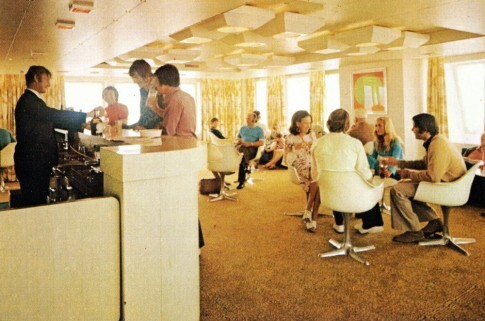 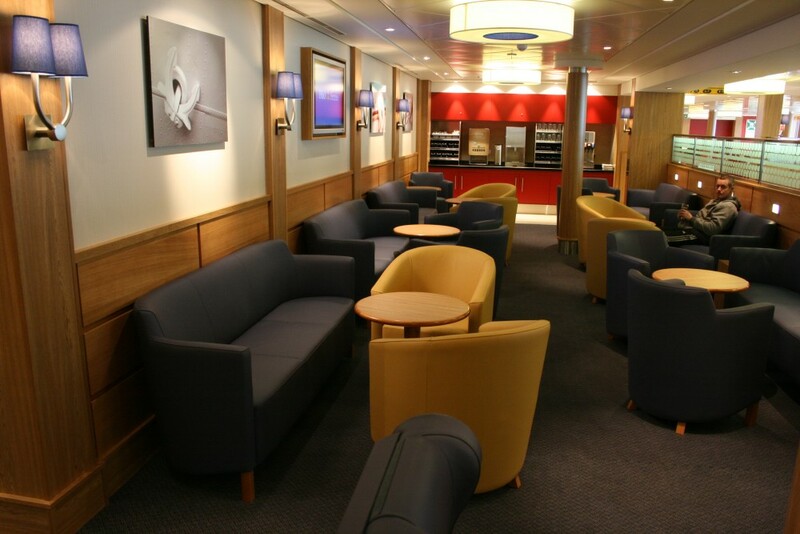 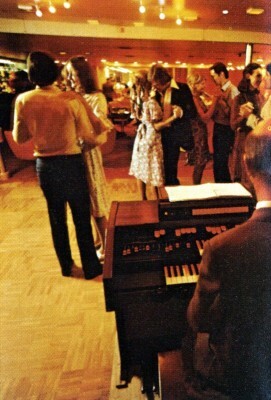 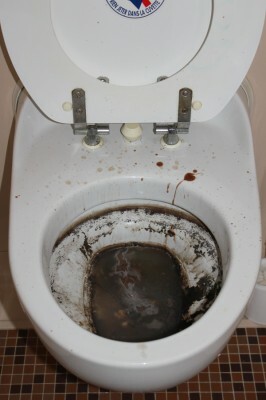 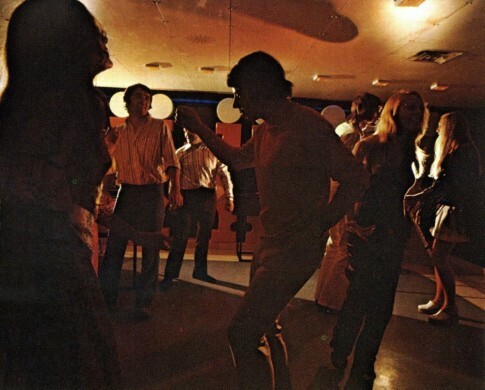 Spirit of Britain: Club lounge. Pride of Kent: Club lounge. 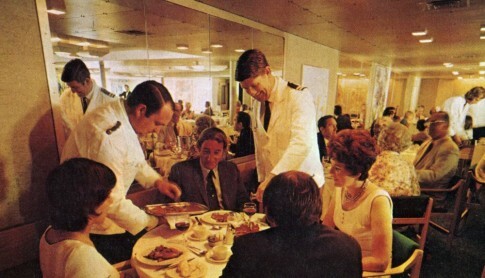 The Brasserie, stripped of the previous Langan’s name, has a fine entranceway with boutique “shopping opportunities” possibly influenced by that of the Romantiques restaurant on Brittany Ferries’ Mont St Michel. Beyond the entrance the Brasserie is, however, curiously bland and somehow missing a touch of luxury. Spirit of Britain: The Brasserie. 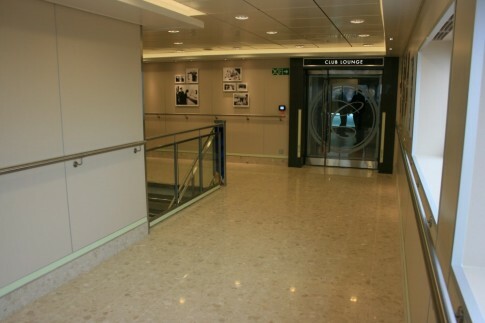 Spirit of Britain: entrance to the Brasserie. 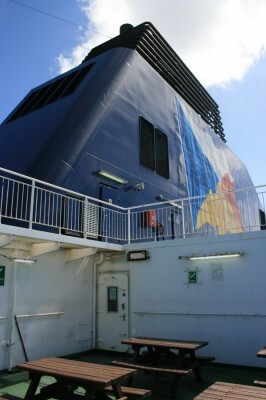 Mont St Michel: entrance to Les Romantiques. 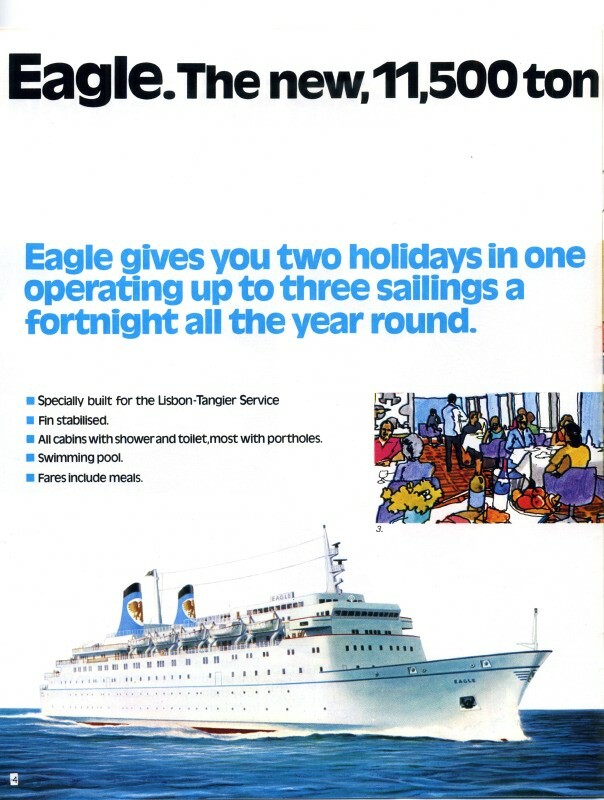 I struggle to think of another ferry where the company insignia is so prominently displayed throughout and there is no doubting this is a P&O ship through and through. 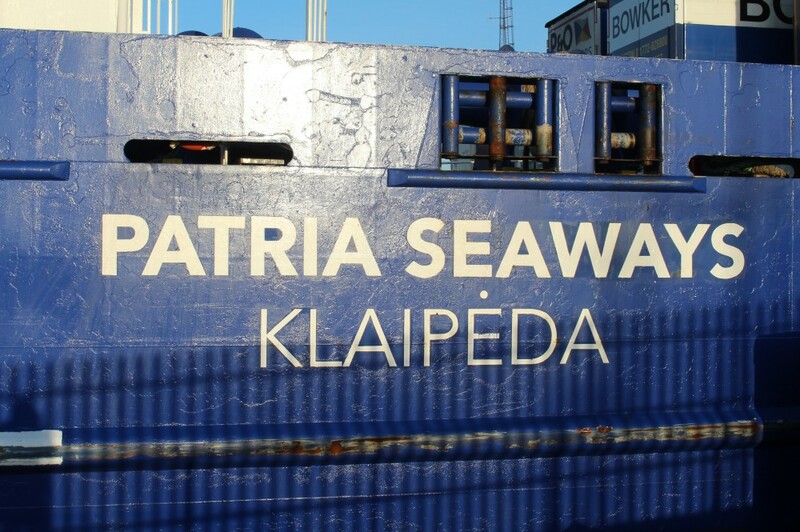 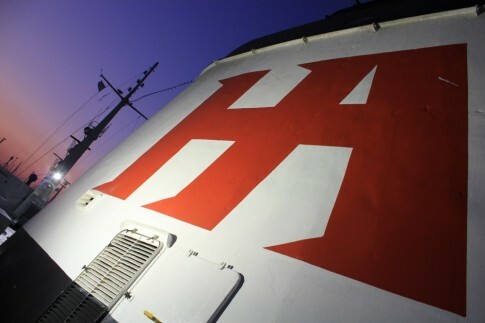 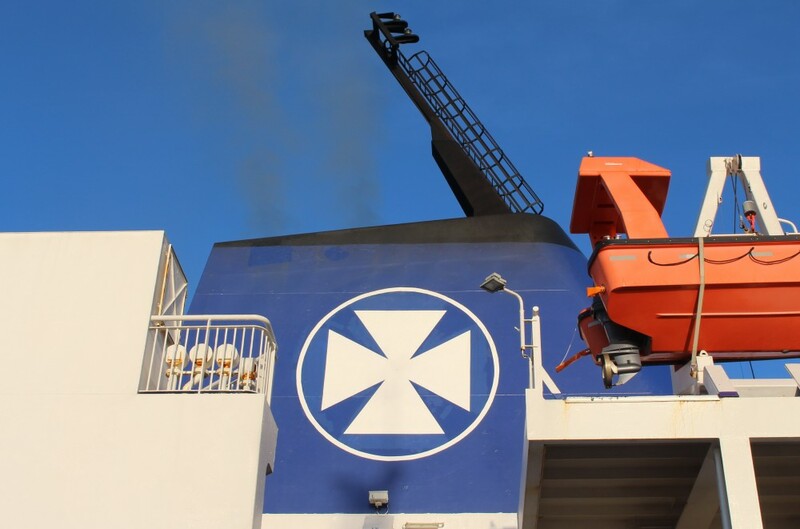 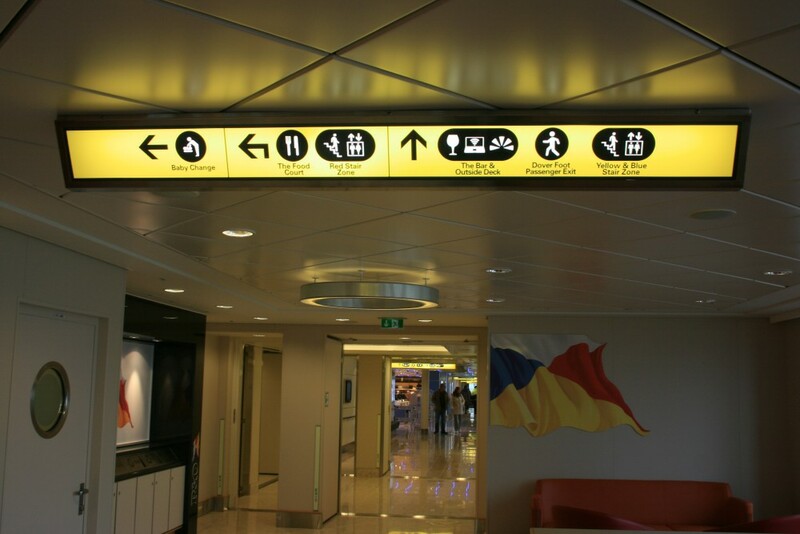 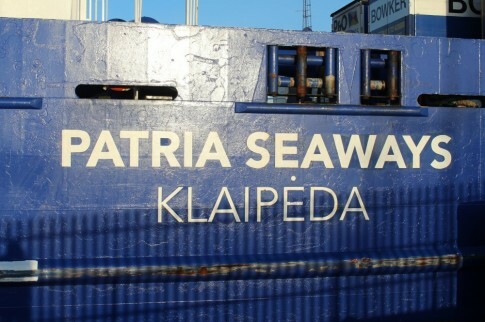 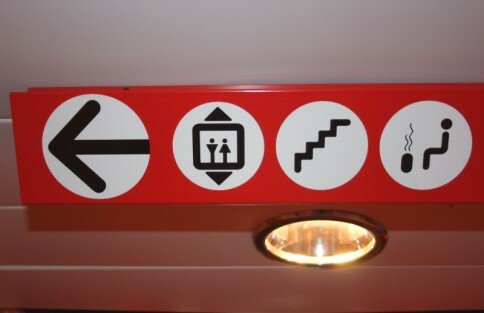 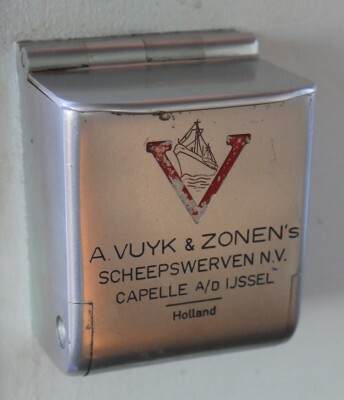 The treatment of the stairwell entranceways on the vehicle decks is reminiscent of the ‘D’ Class but all general directional signage aboard is similar to recent Tallink ships, in the form of deckhead-mounted panels. 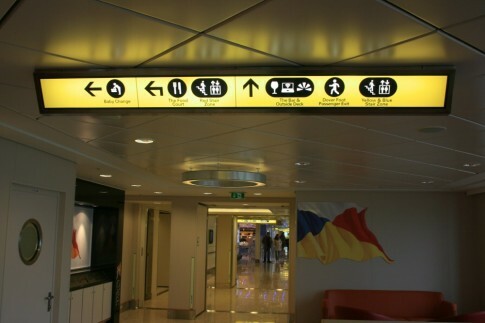 The black-on-yellow scheme however takes a clear steer from that still found at many British airports and derived from concepts drawn up by the doyens of British signage, Jock Kinneir and Margaret Calvert. 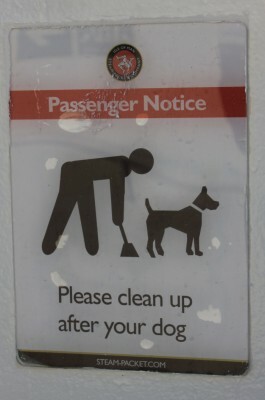 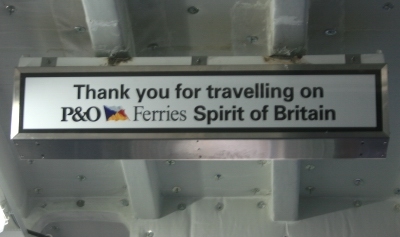 Spirit of Britain: general signage. 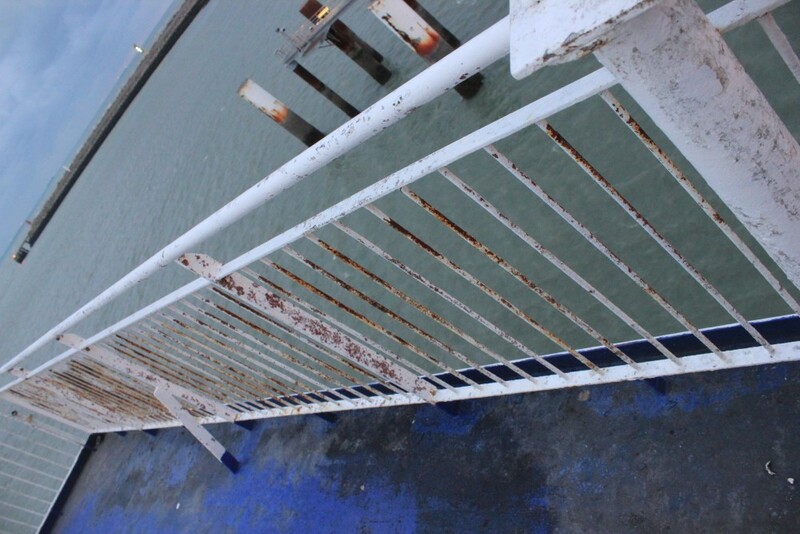 Spirit of Britain: car deck stairwell treatment. 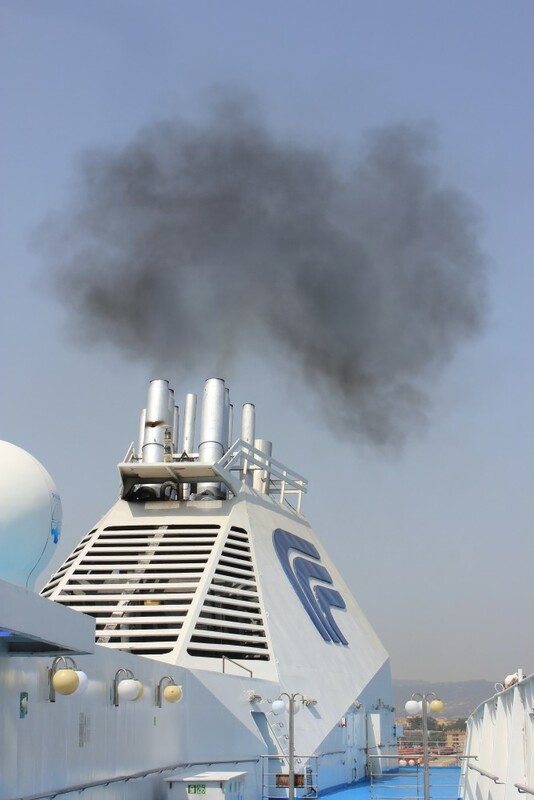 P&O + recycling = the halo effect? 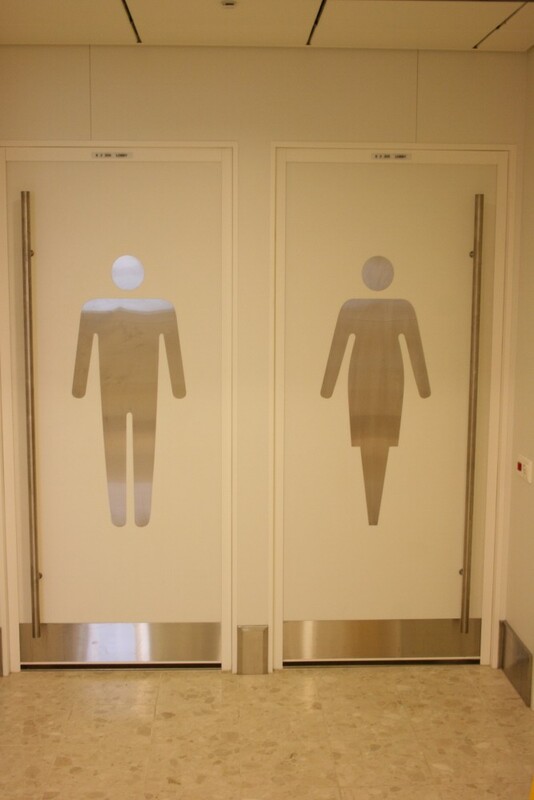 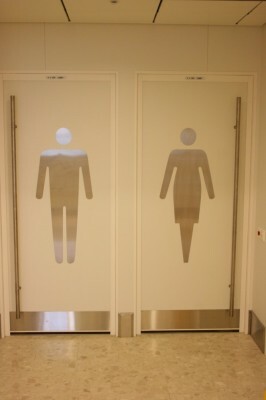 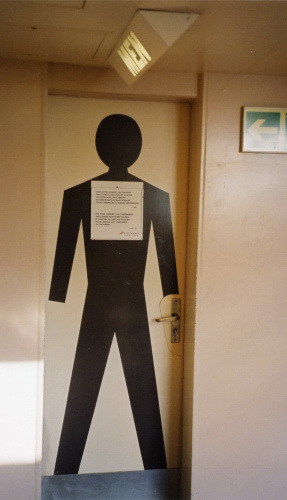 The giant human figure pictograms on the doors leading to the lavatories are a nod to Warren Platner’s work on the Fantasia and Fiesta, as indeed is the raised centre section of the self-service – designed on Platner’s ships to provide a view of the sea over the heads of other diners, thus ensuring that “each table should be the best seat in the house”. Throughout Deck 8, there are panels featuring images of well known British landmarks; from the Angel of the North and the ‘Gherkin’ to the Palace of Westminster and Stonehenge, this is a mixture of contemporary and historical Britain into which P&O doubtless consider their own story, up to and including their new ship, is interwoven. 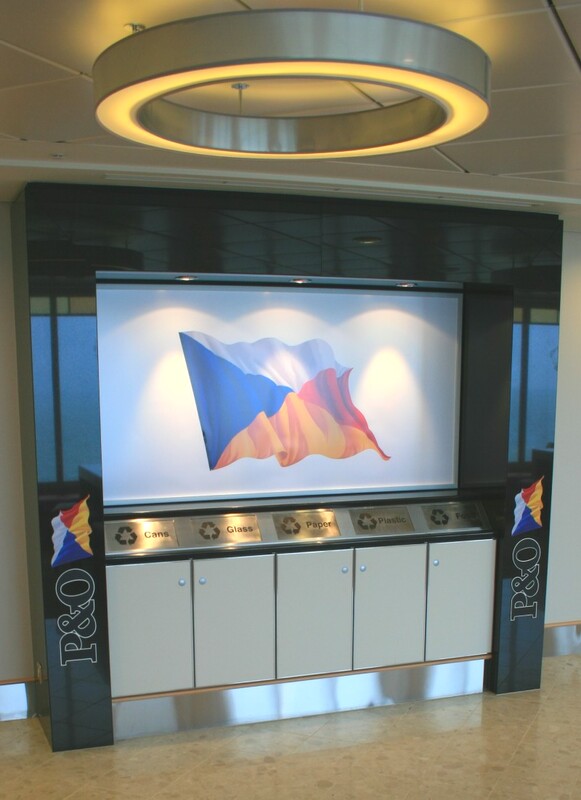 At the Red Staircase on Deck 8 is a large panel offering a history of P&O; this could be compared to the Viking XPRS whose stairwells feature photomurals of earlier ships but here it is much less extensive and there is a degree of picking and choosing history: North Sea Ferries’ Norland had a fine Falkland’s War pedigree but only later did she became a fully-fledged P&O ship. 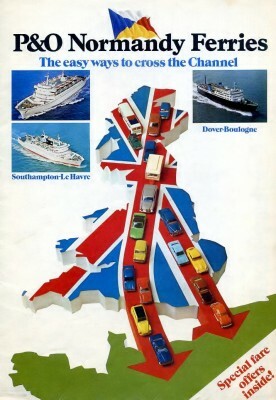 There is a nice image of the Lion entering Dover, but the more locally relevant name of Townsend Thoresen is nowhere to be found. The Norland also reappears in one of the photographs from the P&O archive displayed outside the Club Lounge whilst her bell is to be preserved inside the lounge itself. 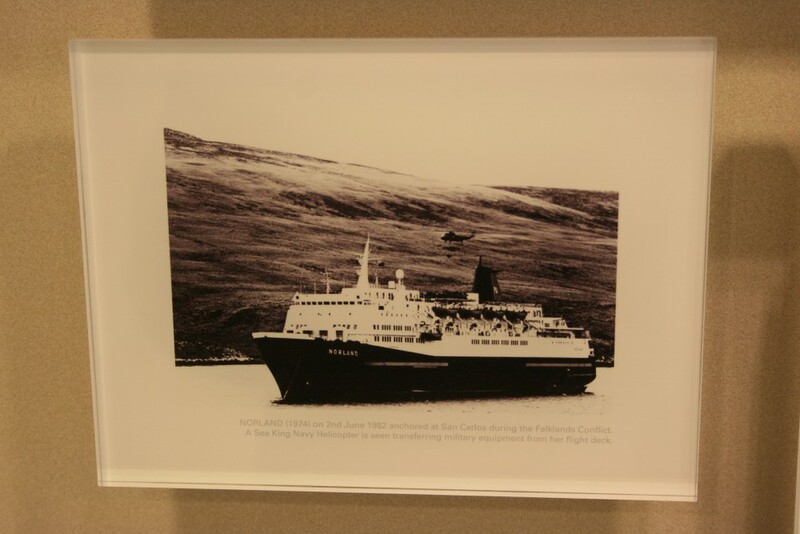 North Sea Ferries' Norland features in this picture outside the Club lounge. 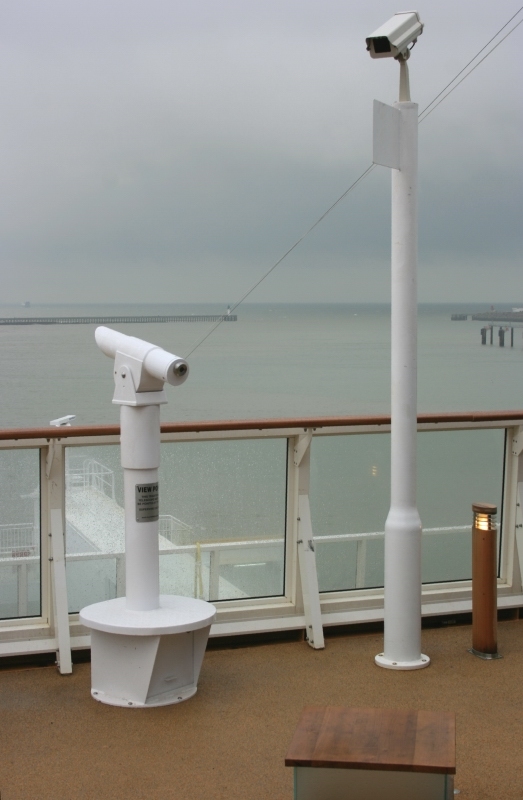 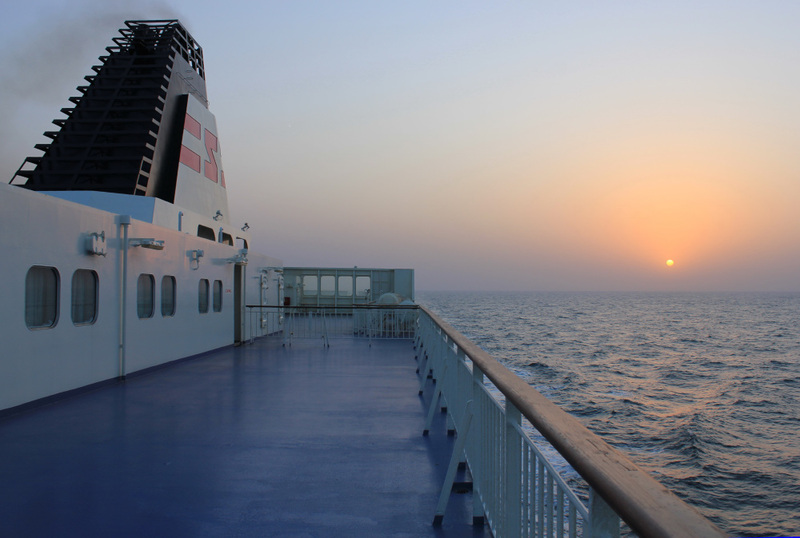 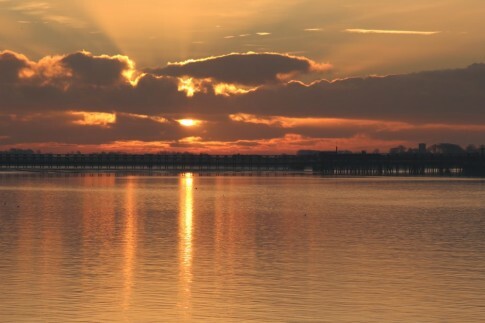 By P&O standards the outside decks are, if not particularly extensive, quite appealing with sturdy deck furniture and free to use fixed telescopes available to view the passing seascape. 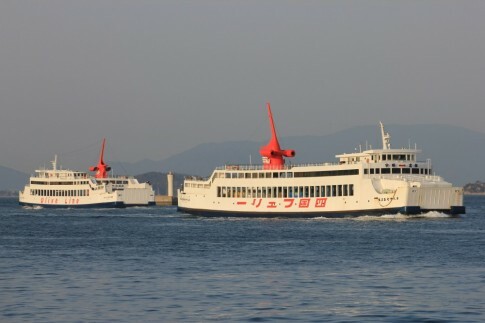 An attempt has been made to segregate smoking from non-smoking deck areas but initial indications are that the distinction is not being observed in practice. 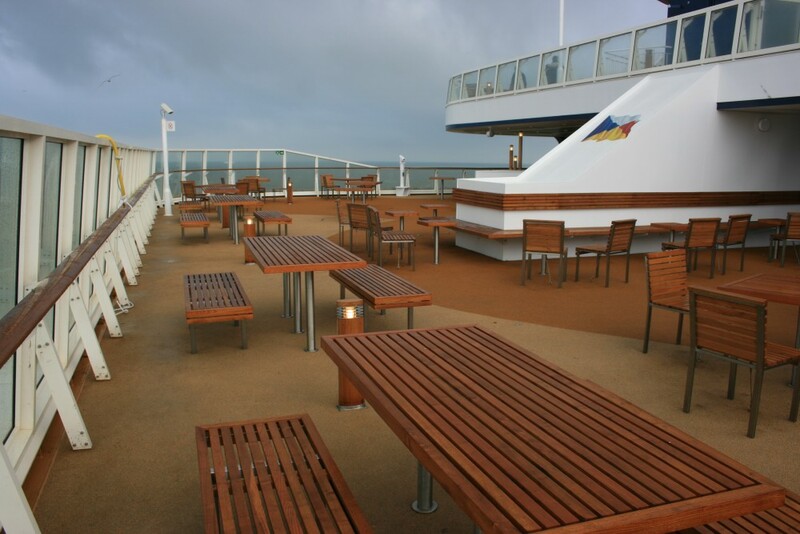 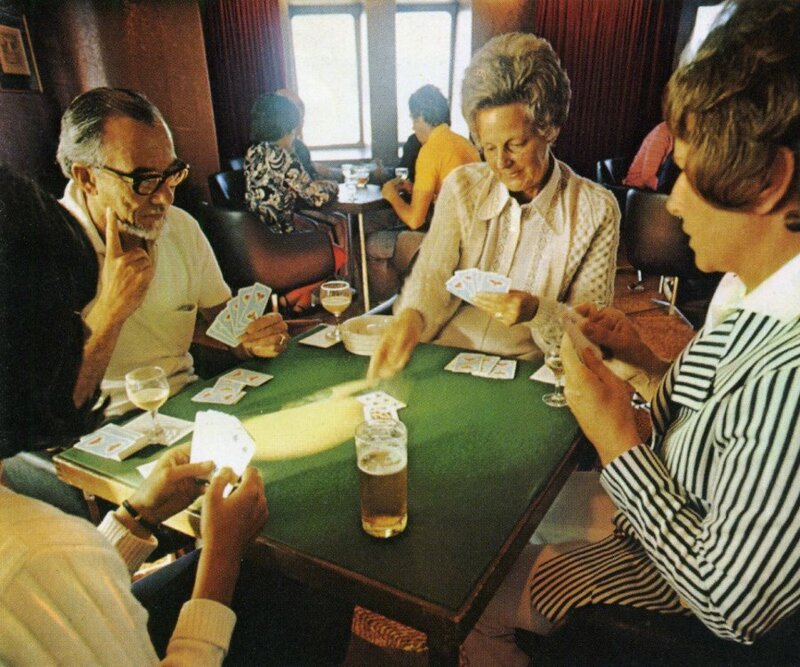 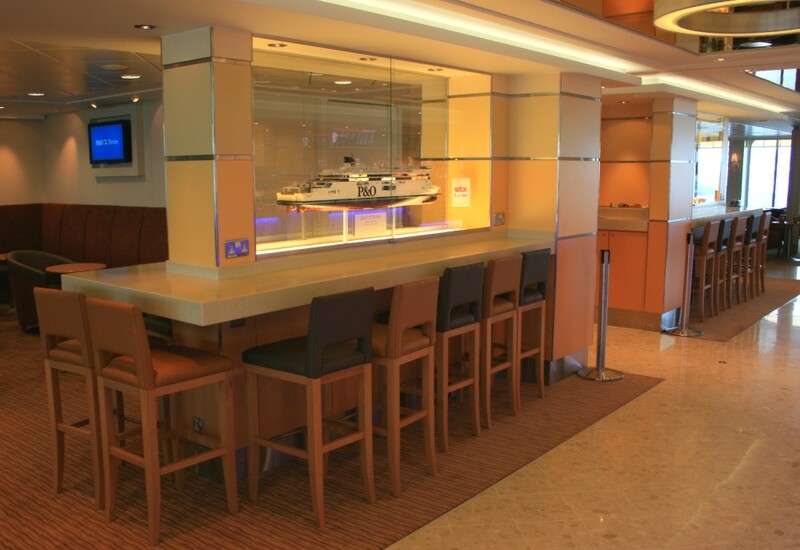 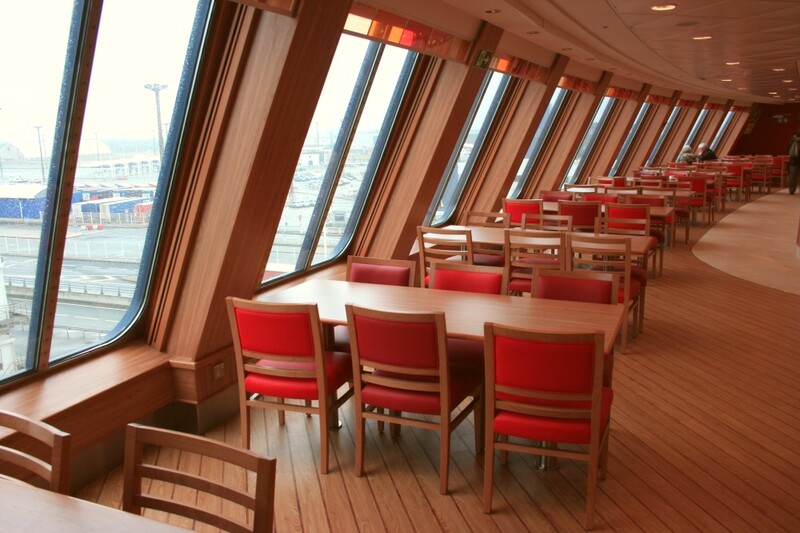 A deck bar is also provided for Summer use – something not seen on Dover ships since the former Stena Fantasia and Stena Empereur. 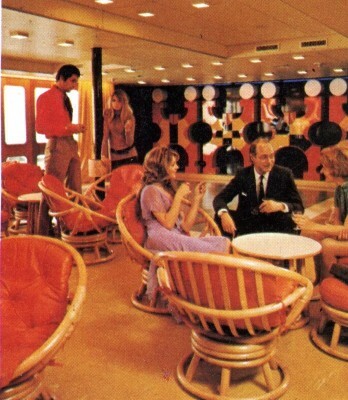 The Club lounge’s own dedicated area of outside deck meanwhile harks back not just to the Motorist Lounge “pens” on the aft decks of the St Anselm and St Christopher in Sealink British Ferries service, but also the more strictly segregated first and second class deck areas on railway steamers in the earlier part of the last century. 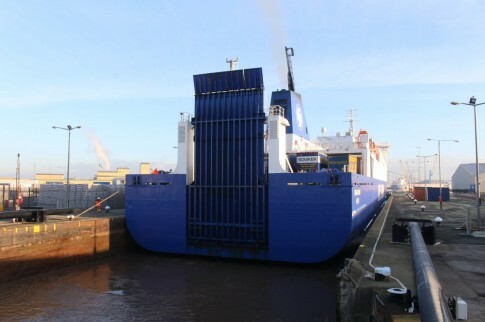 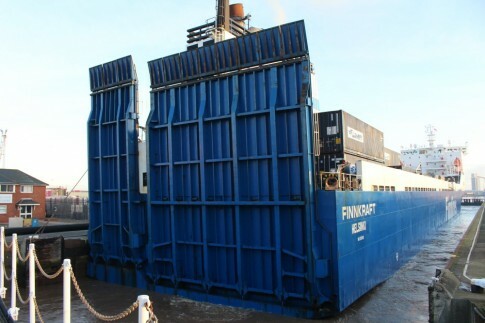 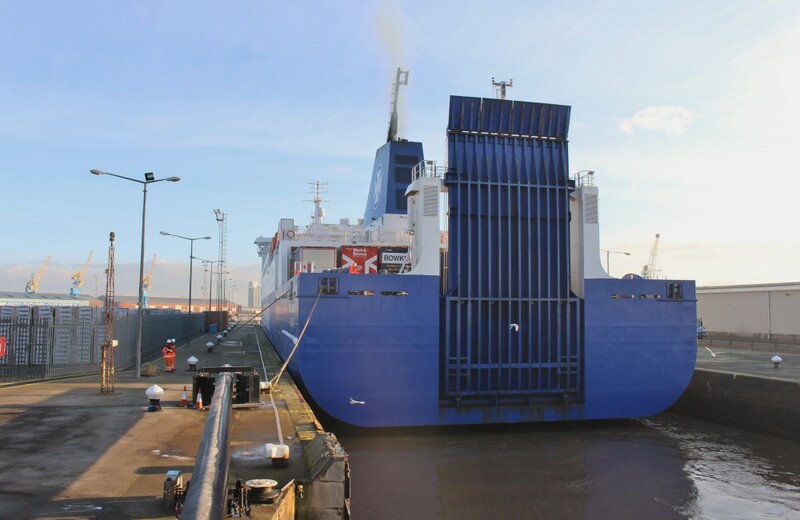 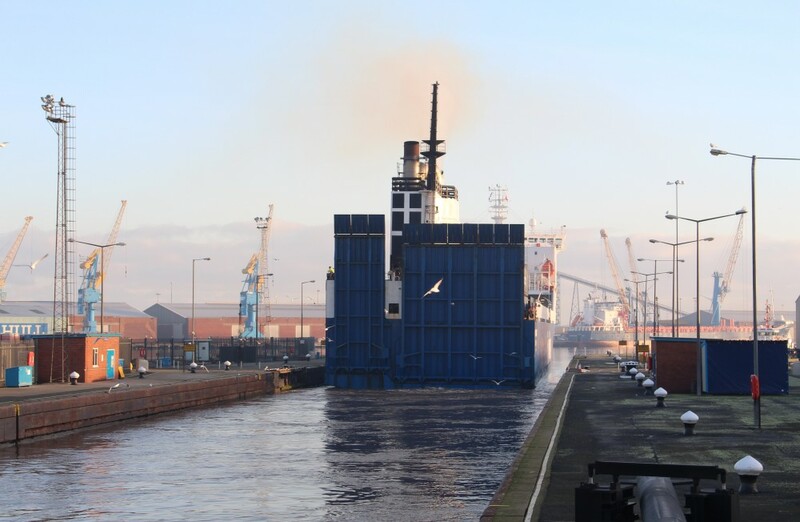 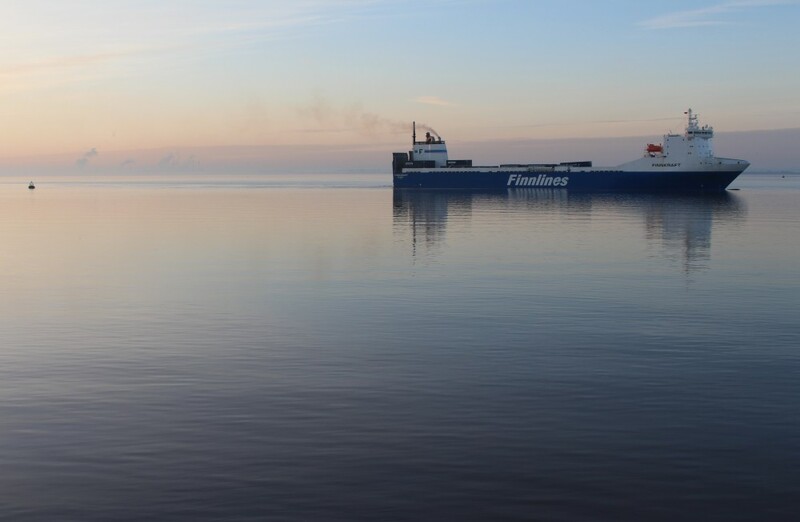 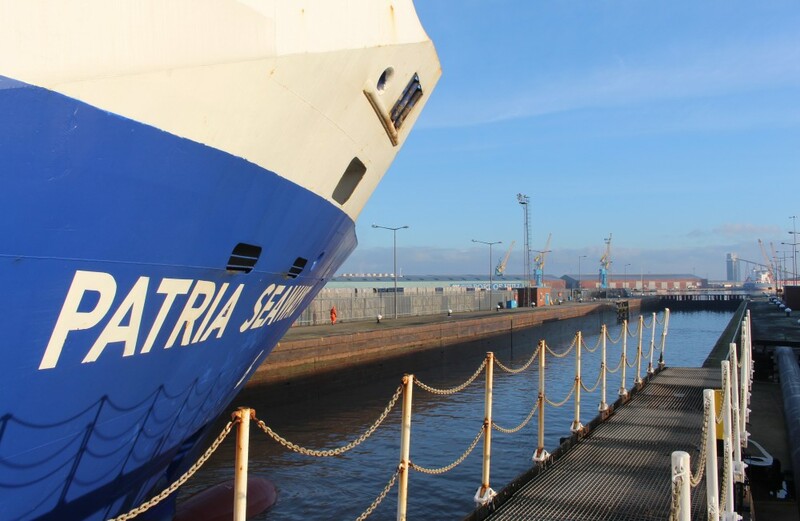 One genuinely new innovation is a small section of dedicated deck space for freight drivers, amidships on the starboard side and accessed directly from the ro-ro lounge. 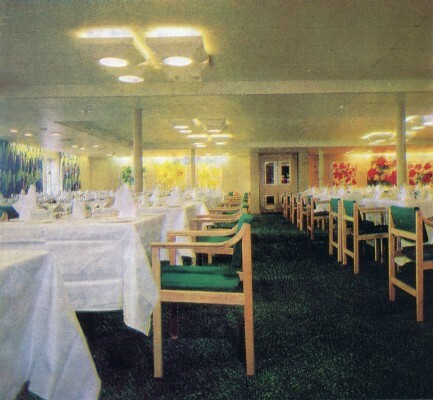 Spirit of Britain: aft on Deck 8. Club lounge - dedicated outside deck. 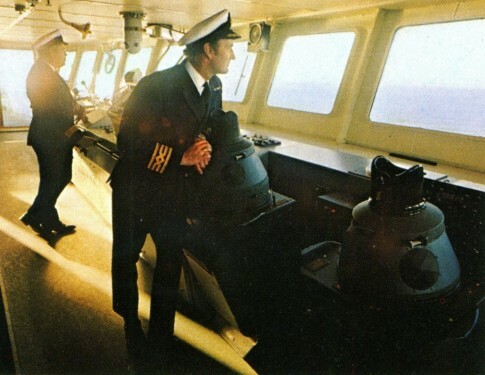 The vehicle decks follow trends set by the ‘D’ Class, and before that the Ulysses. 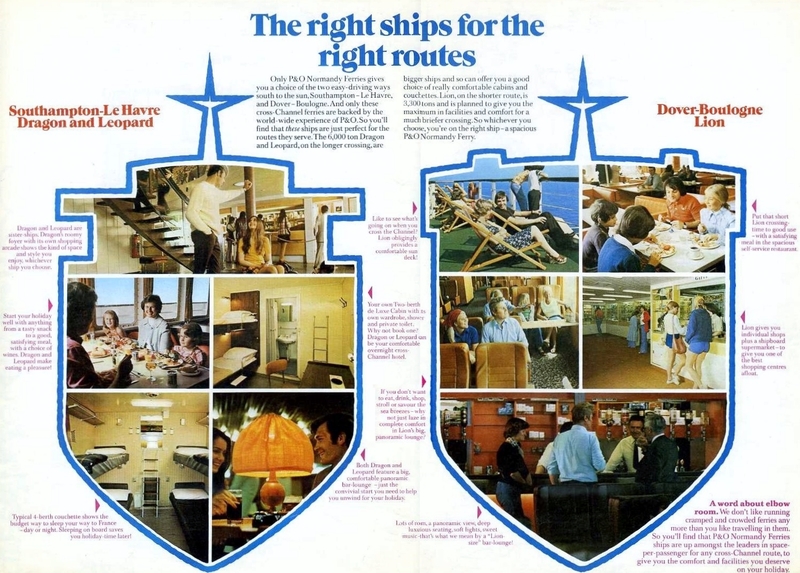 The concepts on the Maersk ships in particular have clearly been studied, and the arrangement of two freight decks with a passenger car deck above, and nearest to the accommodation, is identical, albeit scaled up to reflect the larger ship. 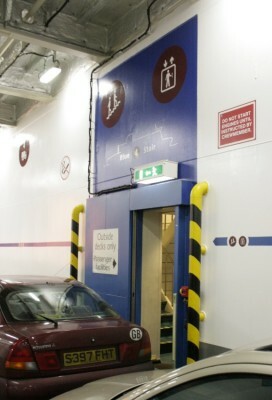 As on the ‘D’ Class the topmost car deck, whose height is rather greater than on the Maersk ships enabling use by smaller vans, is reached by ramps fore and aft from the upper freight deck so the potential traffic conflict between the two is also inherited – something unavoidable with the present linkspan arrangements at Dover and Calais. 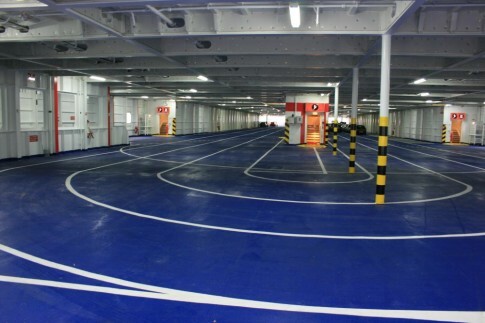 How the top car deck will be utilised on busy sailings remains to be seen, but the deck markings seem to suggest that a variant of the Maersk system whereby cars drive aboard in one quarter, execute a complete loop of the vehicle deck before lining up to disembark from the opposite quarter may be used. 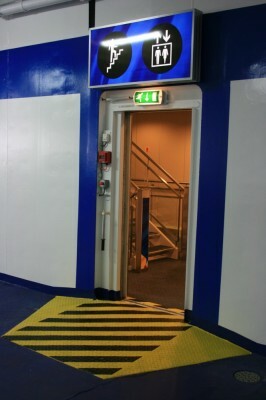 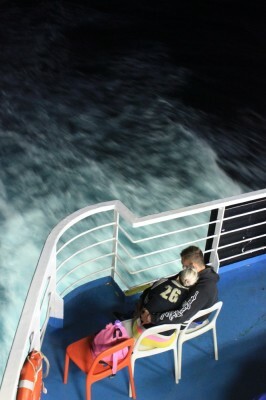 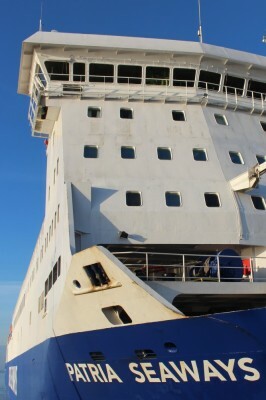 The P&O ships however have ramps in all four quarters and therefore much more flexibility exists. 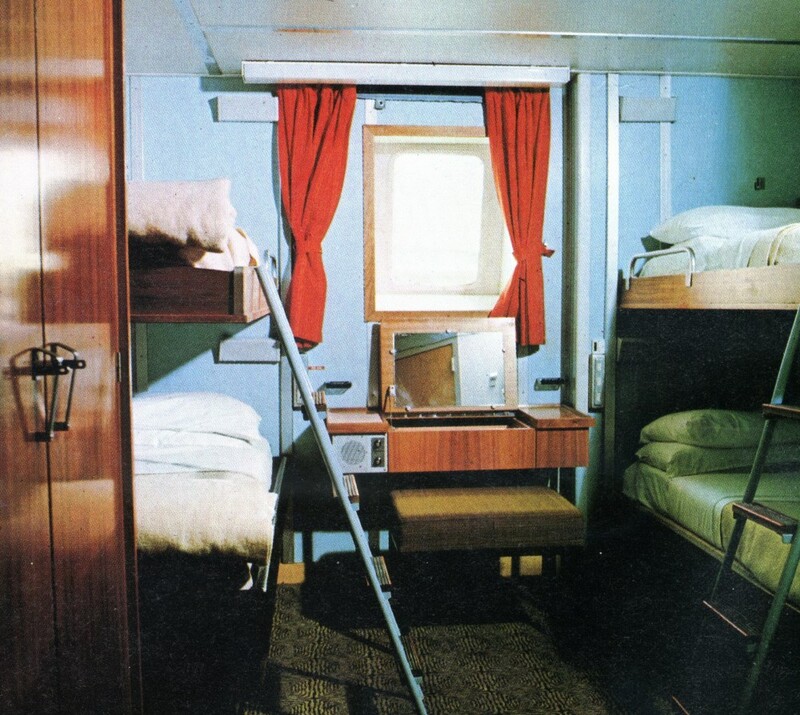 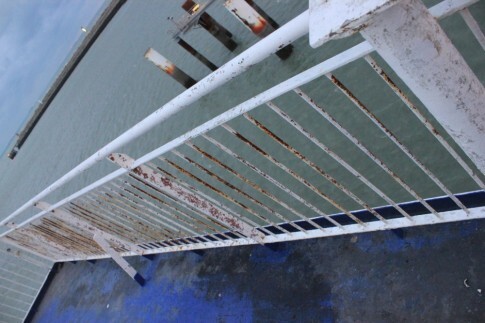 Spirit of Britain: the forward end of the upper car deck. 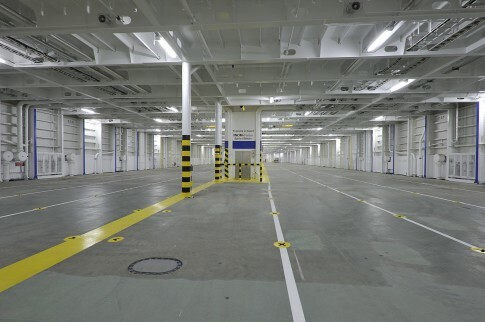 Spirit of Britain: Deck 3 Freight Deck (STX image). There is almost no doubting that the Spirit of Britain will be a tremendous commercial success. 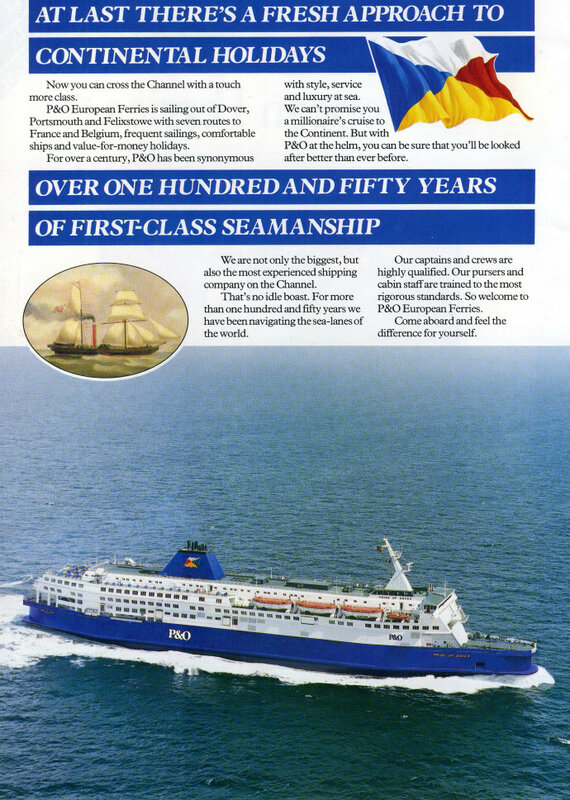 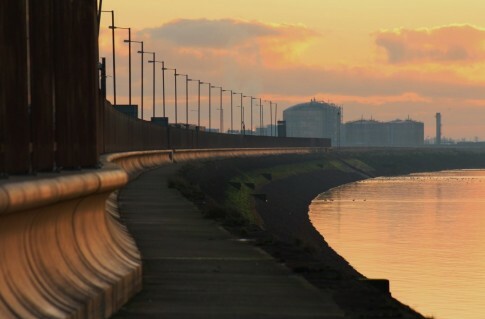 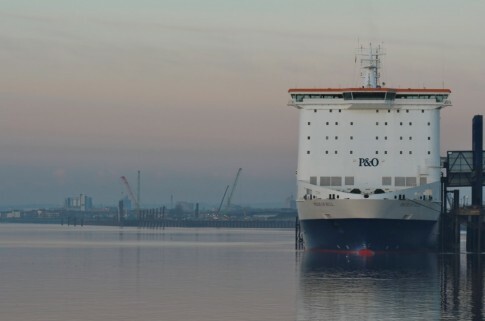 P&O paid a premium to have the ship built at a European shipyard with the highest of reputations and that investment has been rewarded with a high quality of finish. 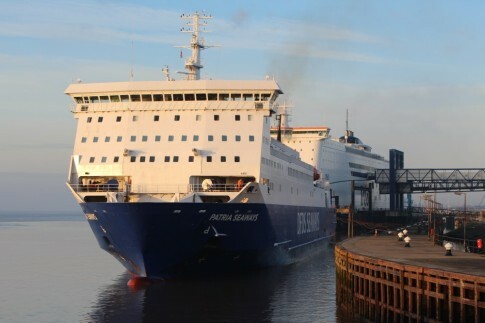 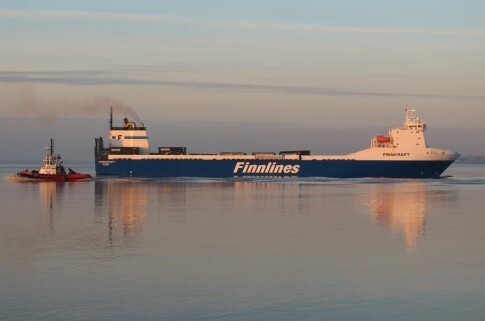 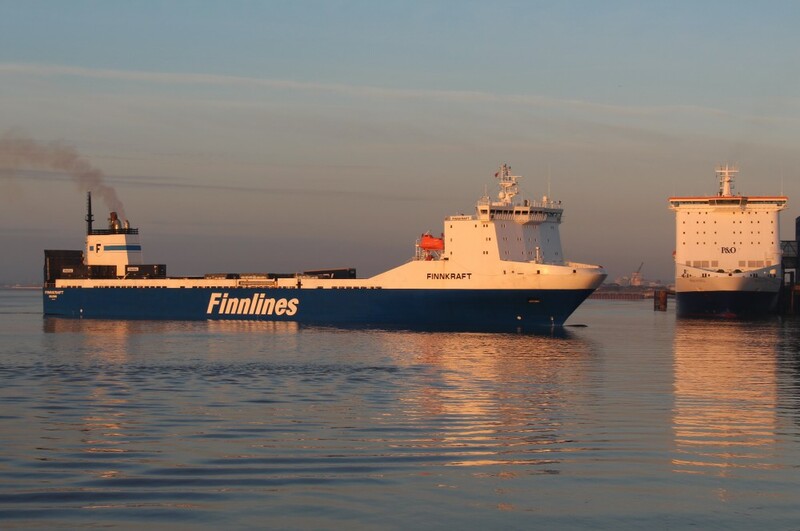 And, if she fails to match the aesthetic highs of other recent day ferries such as Tallink’s Star or even, in places, the Maersk Dunkerque and her sisters, P&O will not be too concerned. 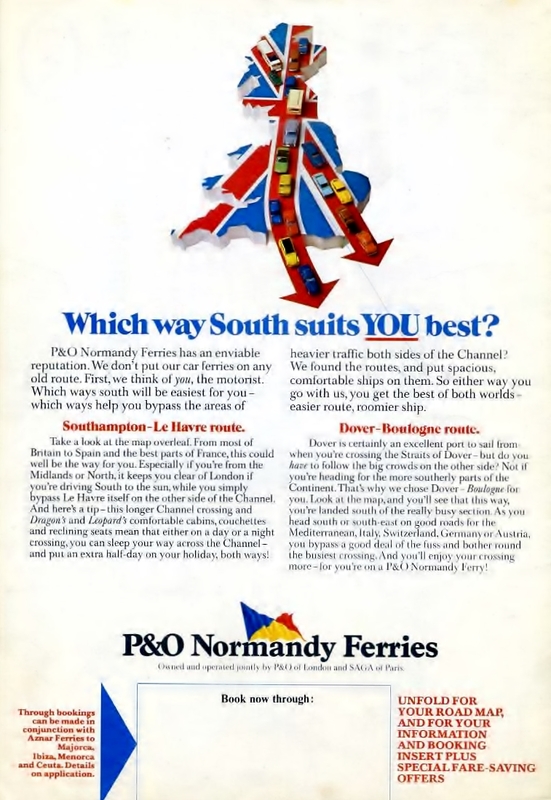 Few passengers are won by aesthetics alone: the P&O brand almost gives them a pass in such respects as comfort and a certain quality of service are presumed to be a given. 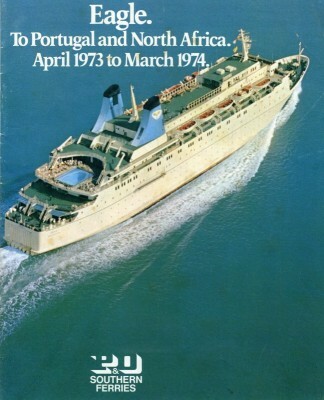 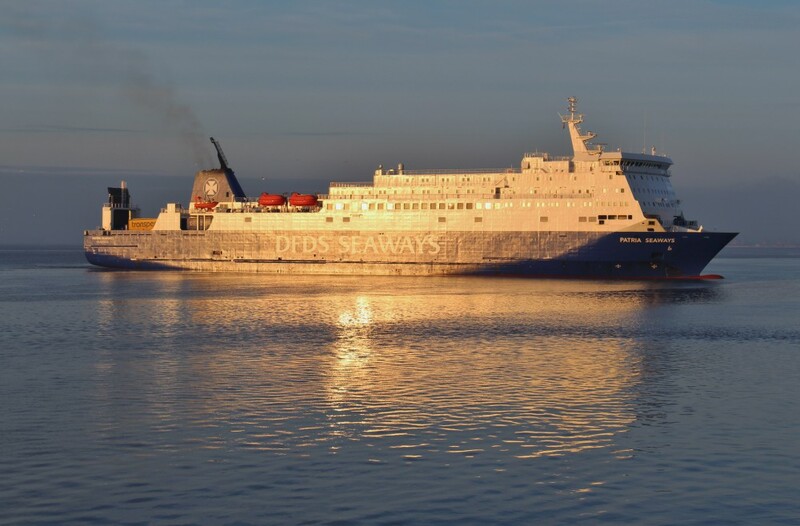 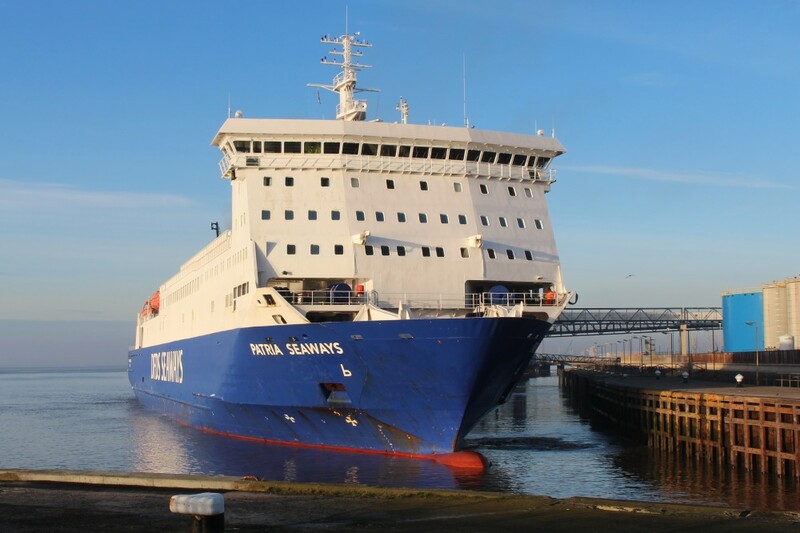 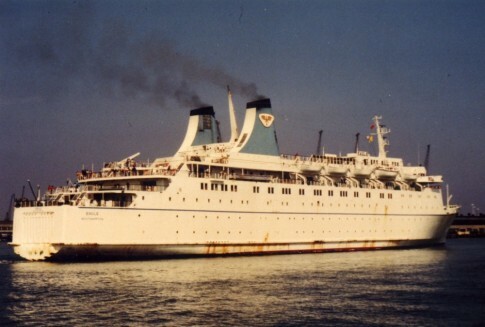 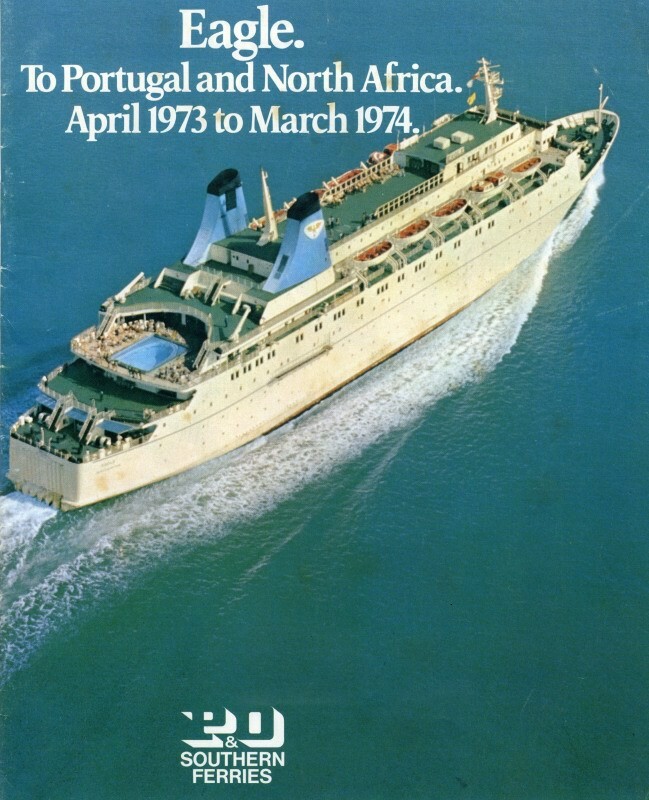 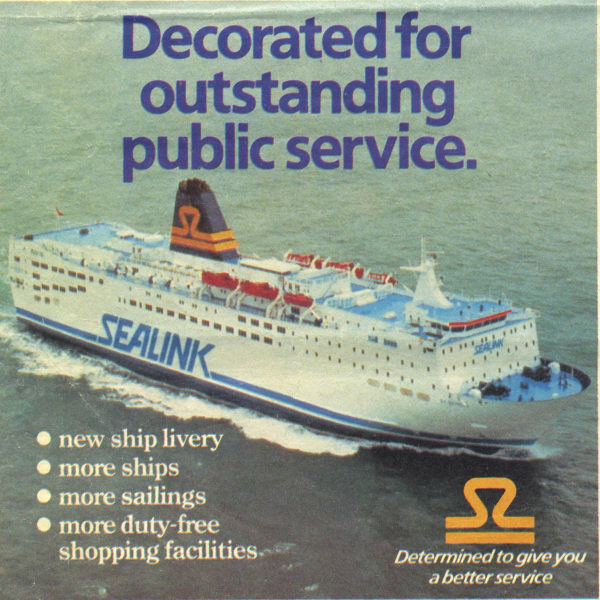 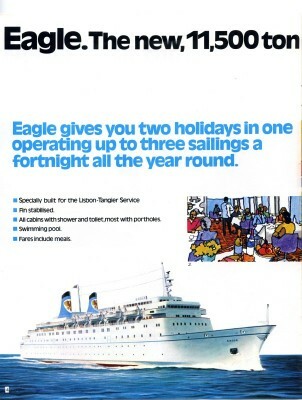 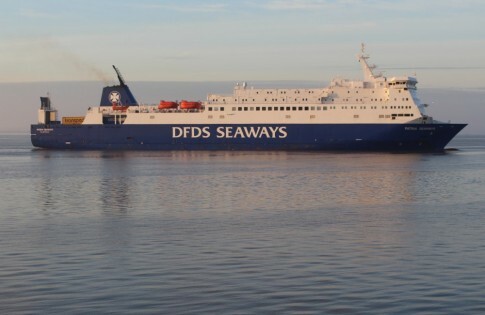 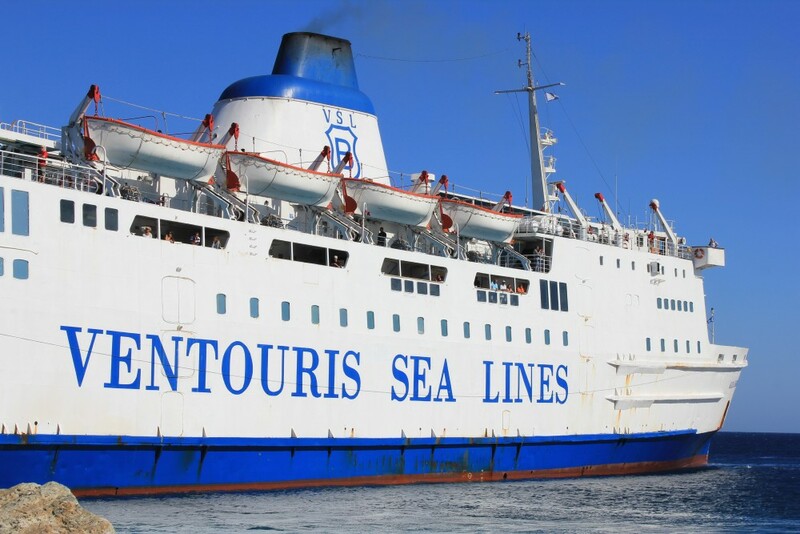 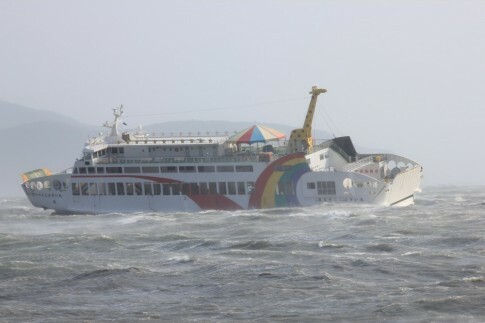 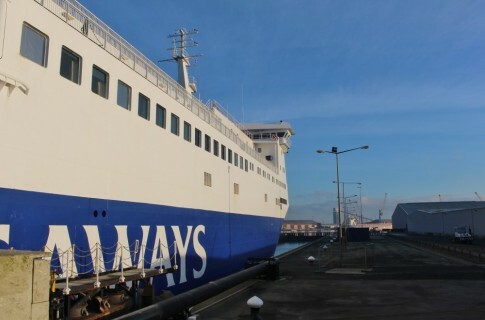 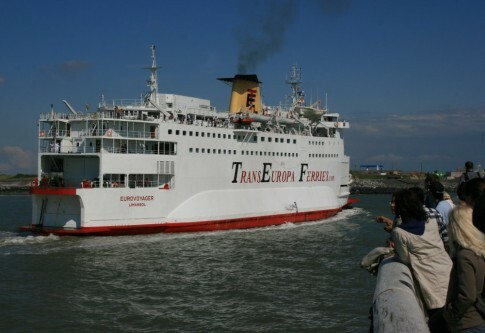 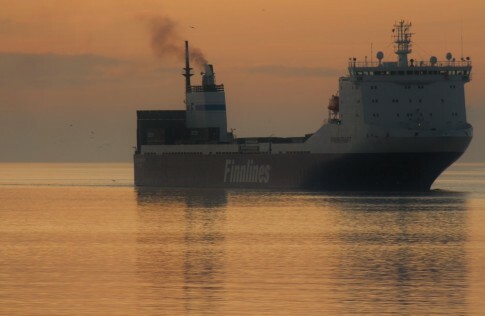 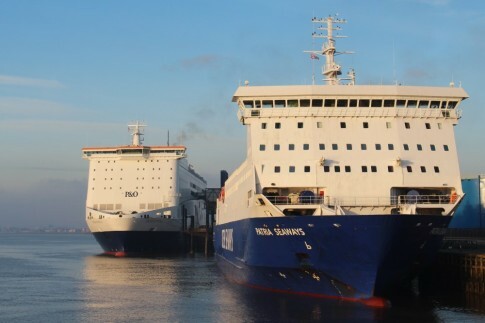 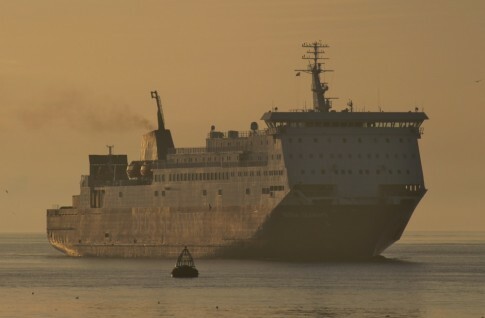 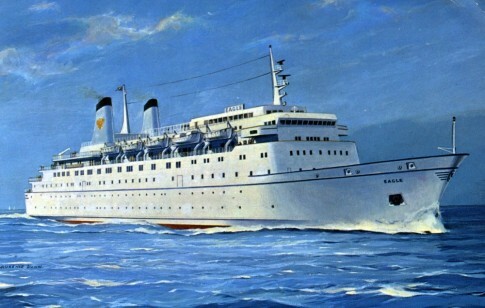 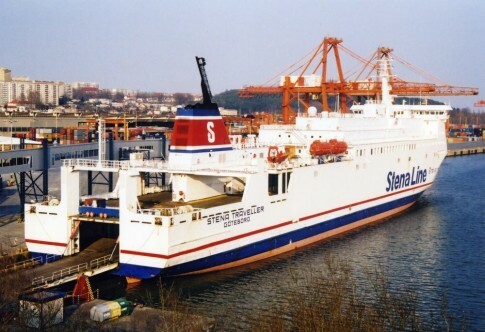 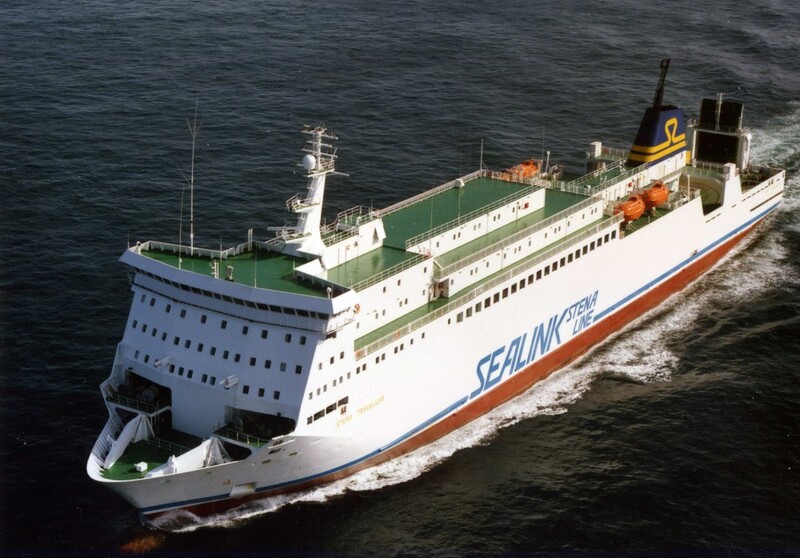 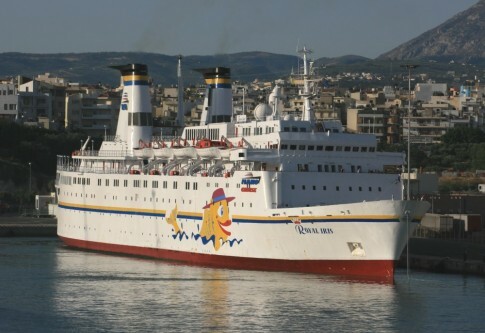 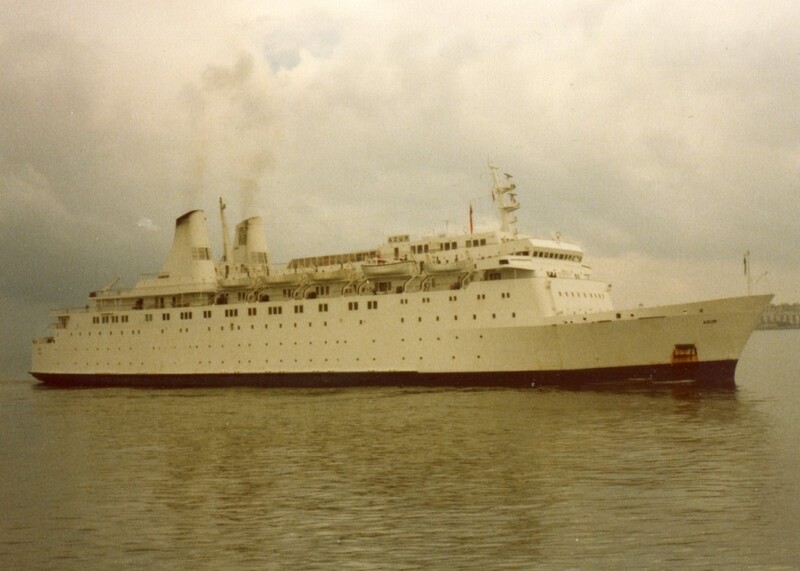 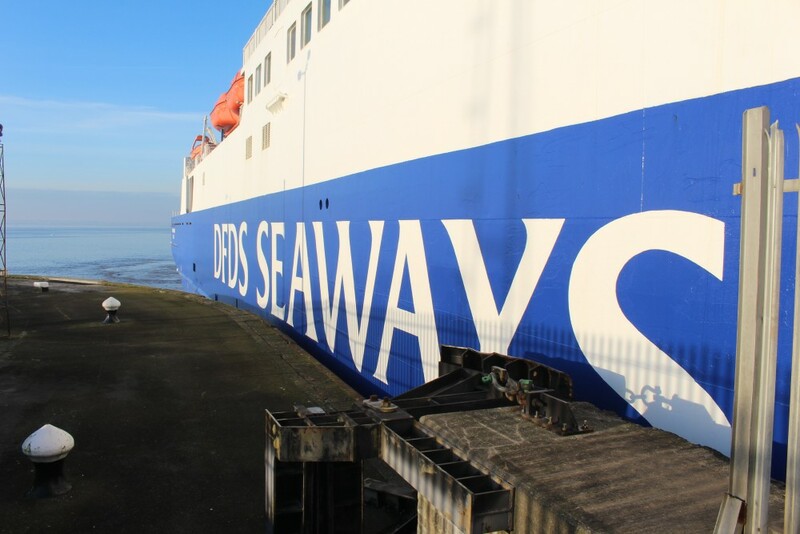 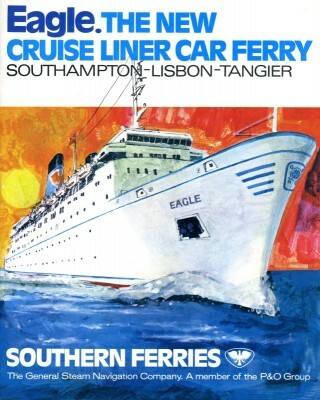 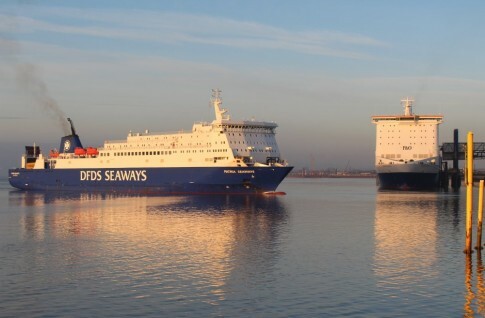 And, if the company has managed to remain clear ferry market leaders with its current Dover fleet – a combination of the grotty, the regrettable and the forgettable – this ship’s comfortable and modern saloons, decent food and dependable service will only cement that leadership. Besides which, it would be churlish to say the Spirit of Britain is not in her own right splendid; she is in almost every respect leagues ahead of the outdated Prides of Dover and Calais and is likely to be making money for P&O after most of her rivals and contemporaries have passed into memory.